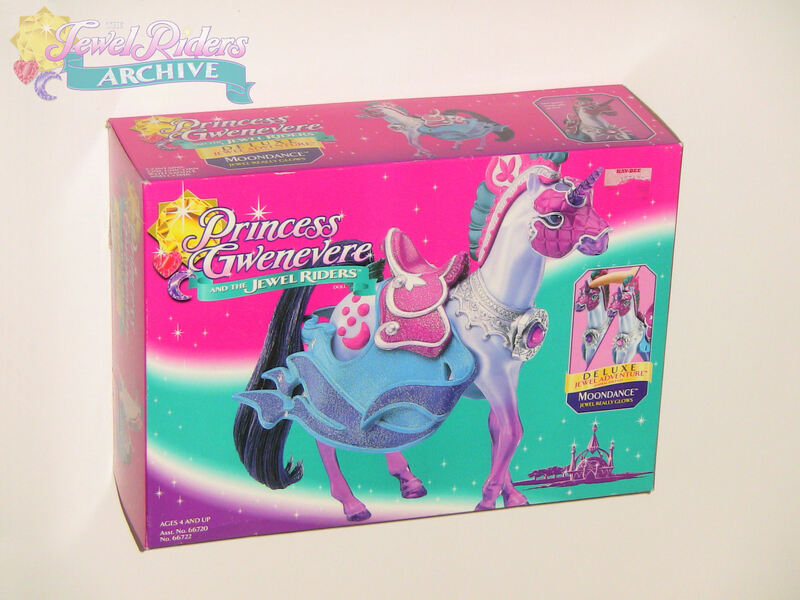 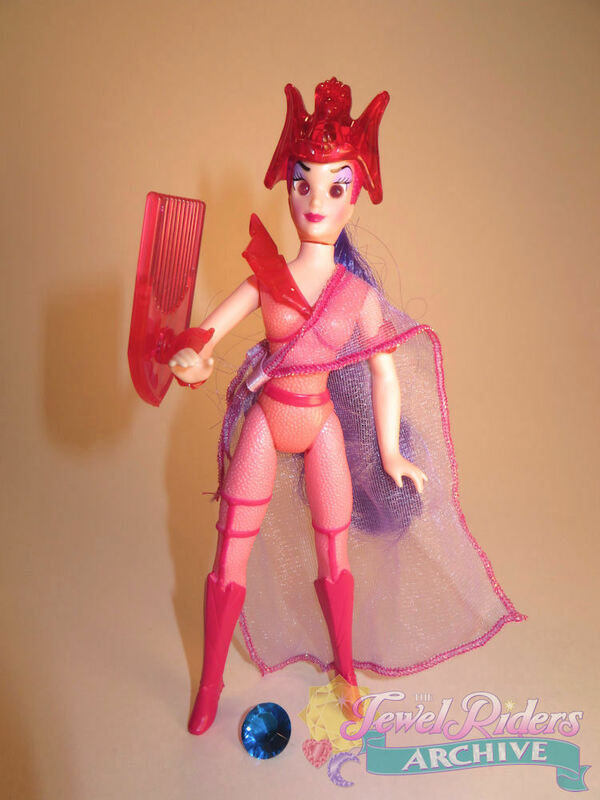 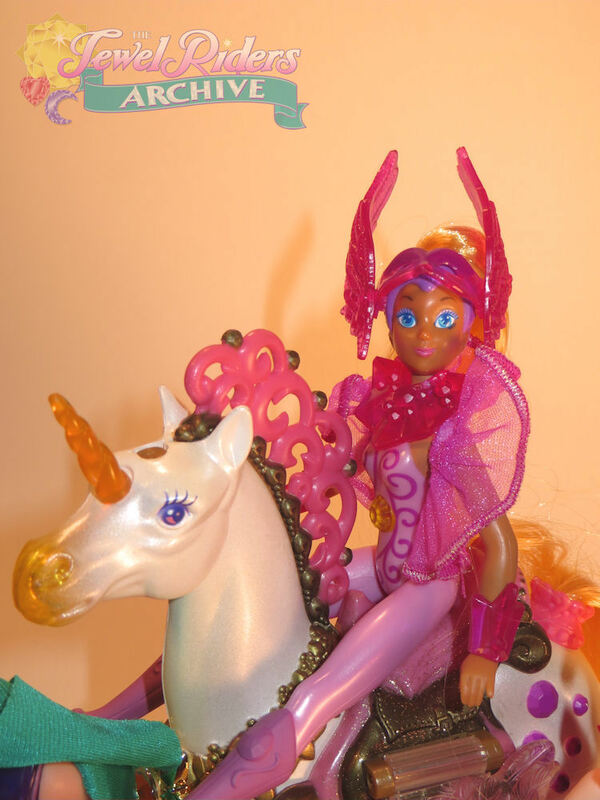 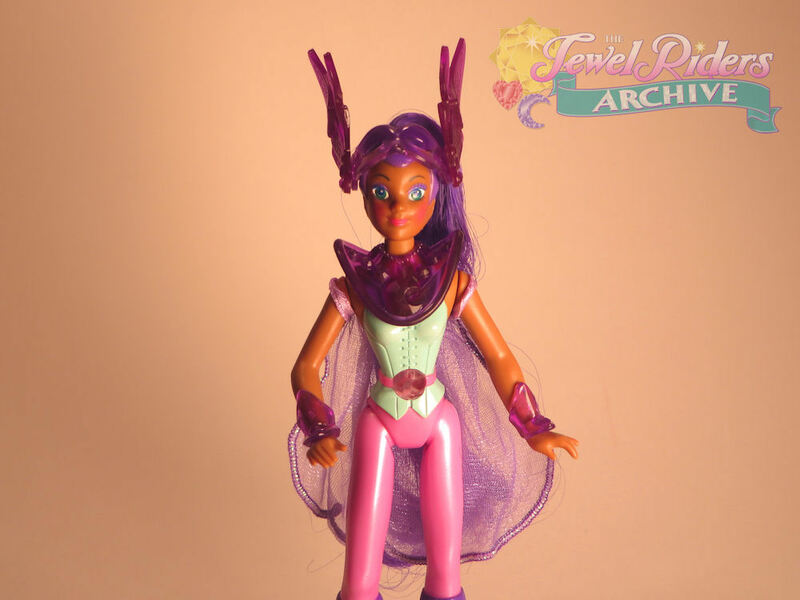 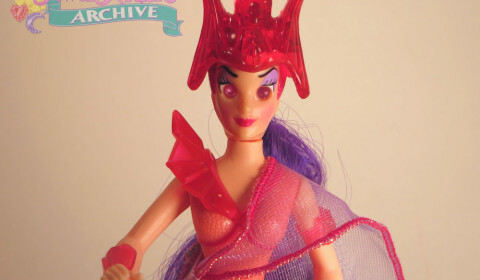 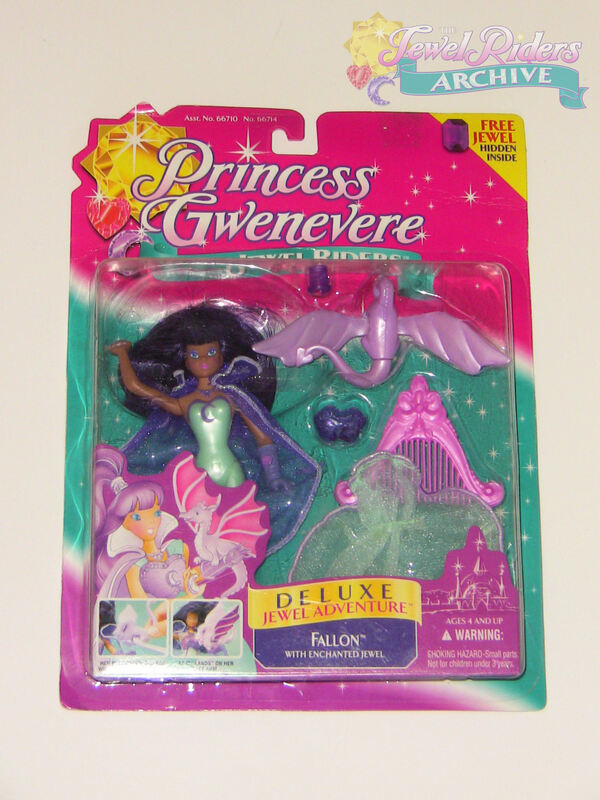 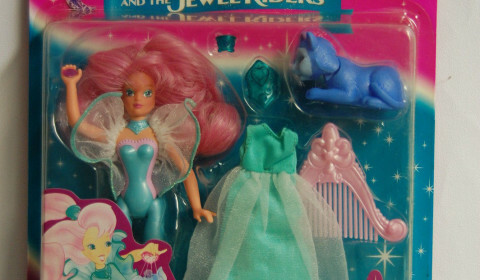 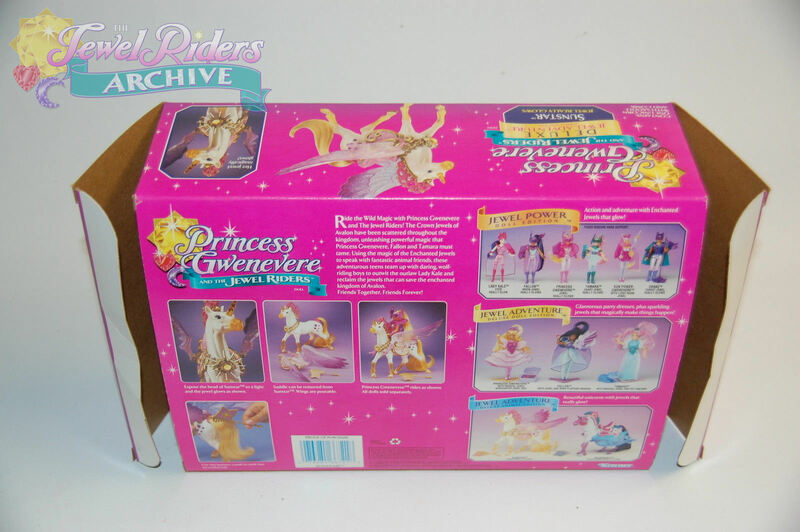 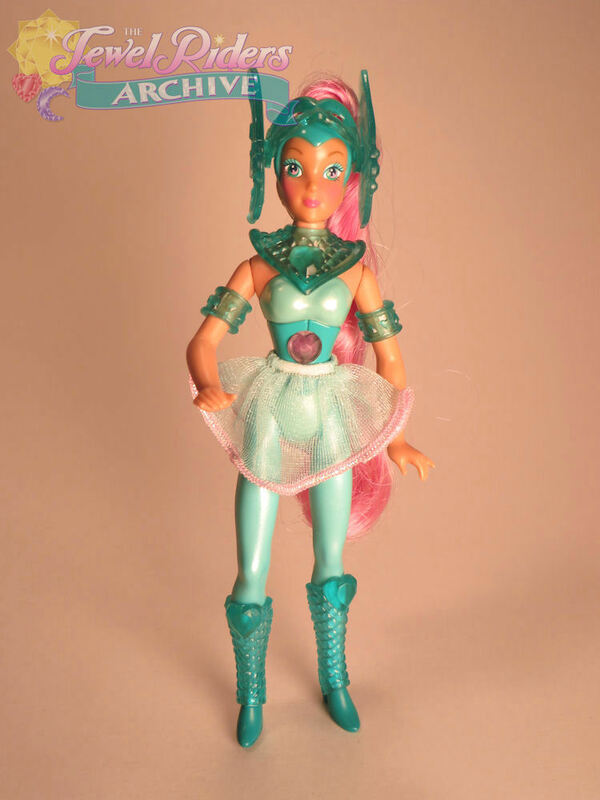 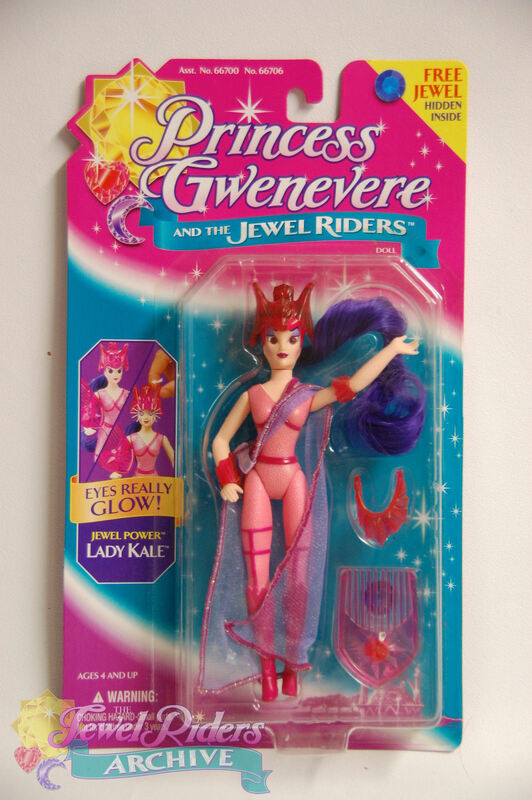 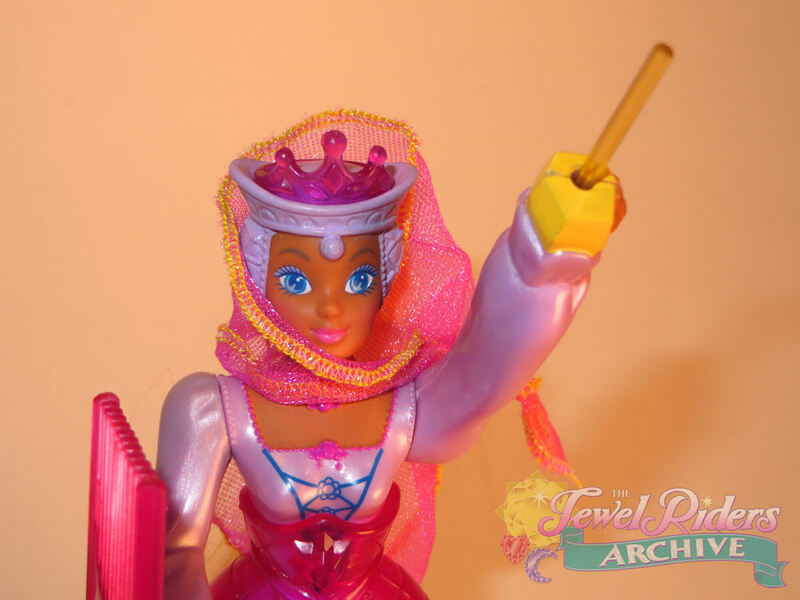 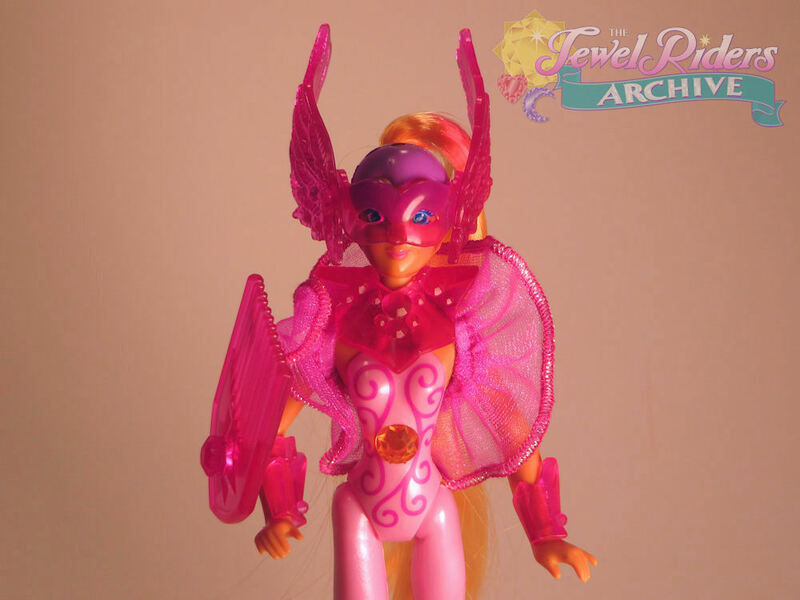 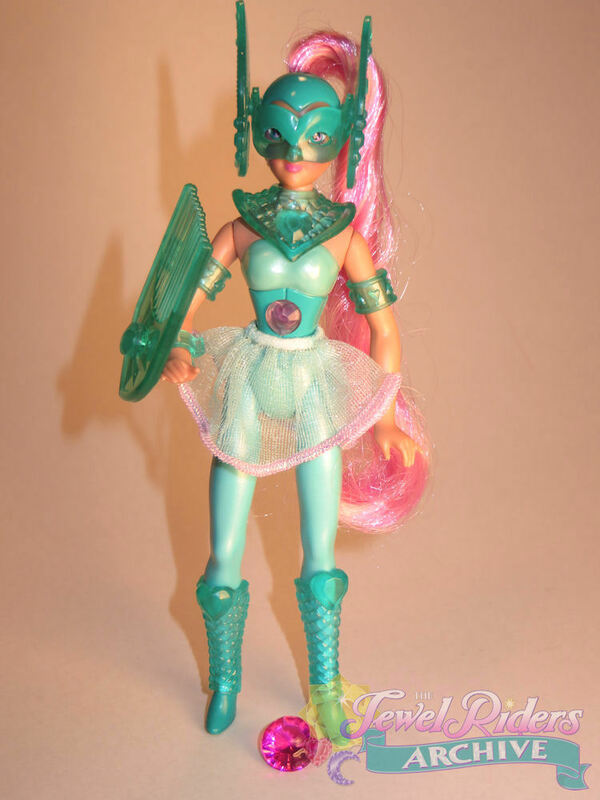 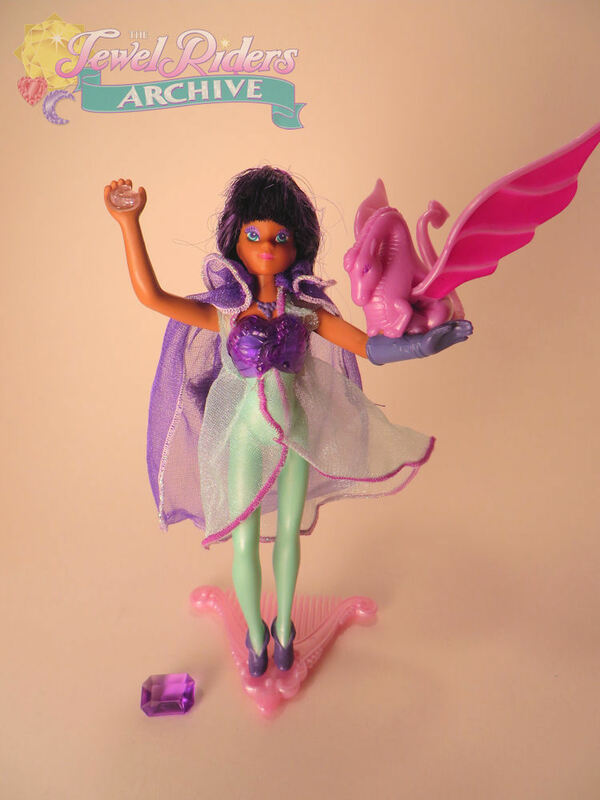 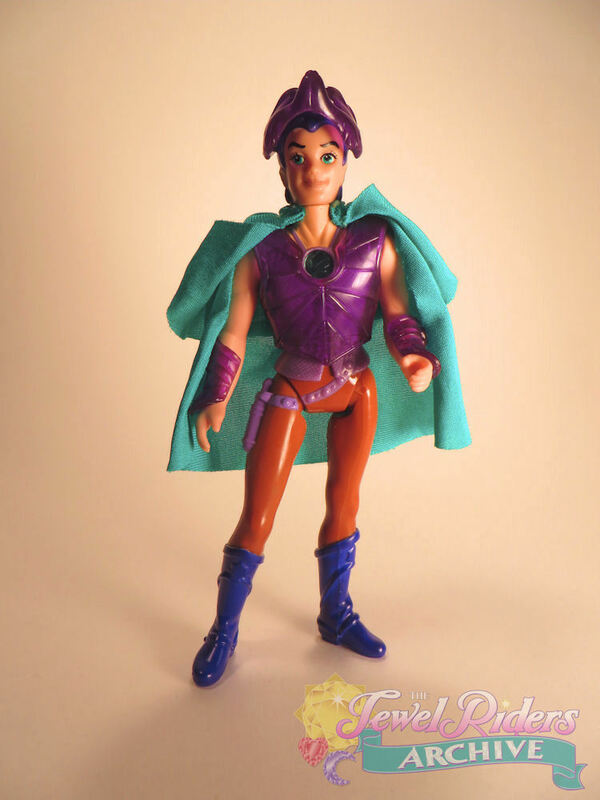 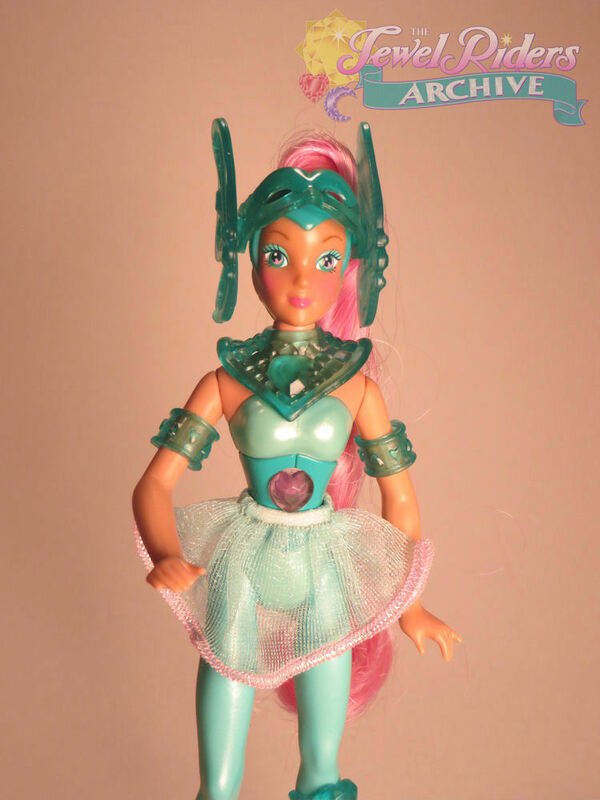 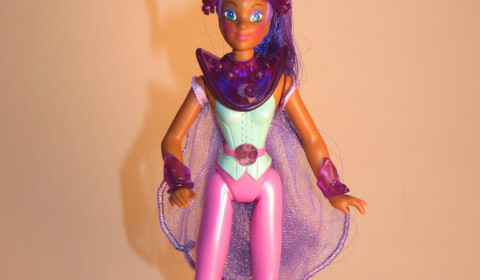 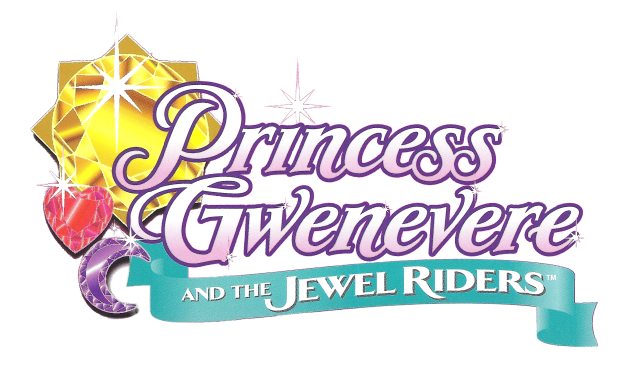 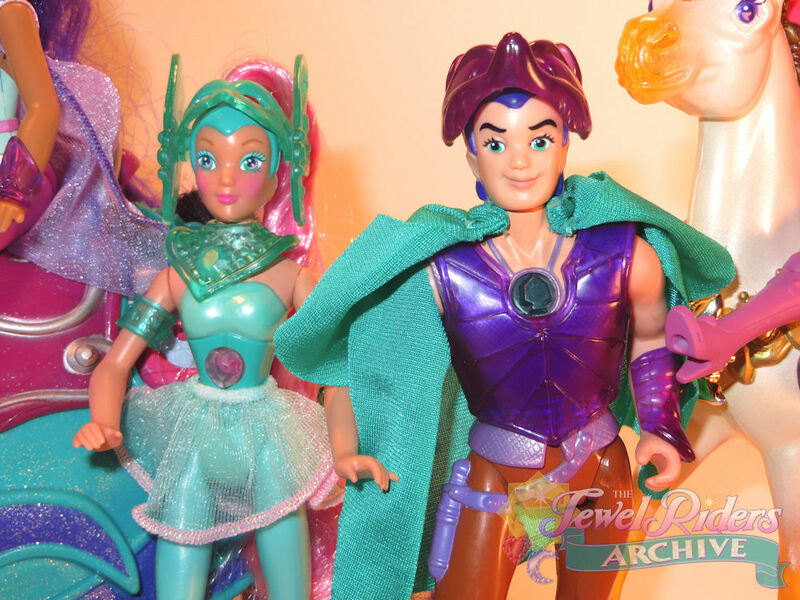 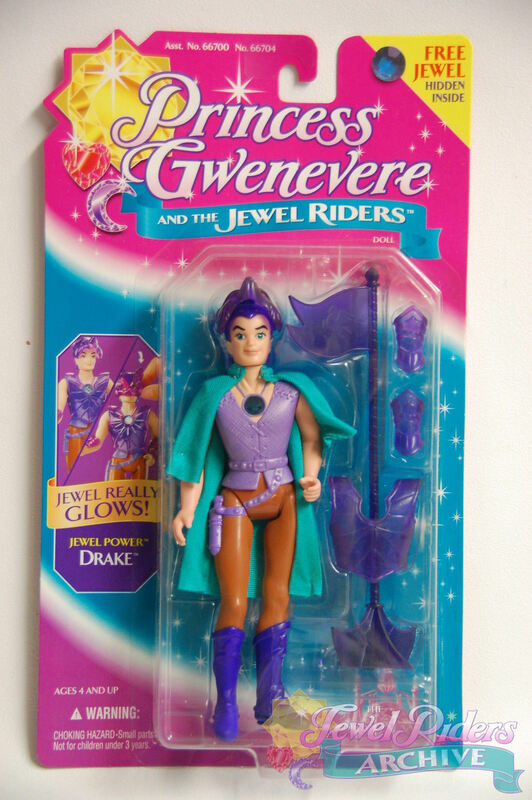 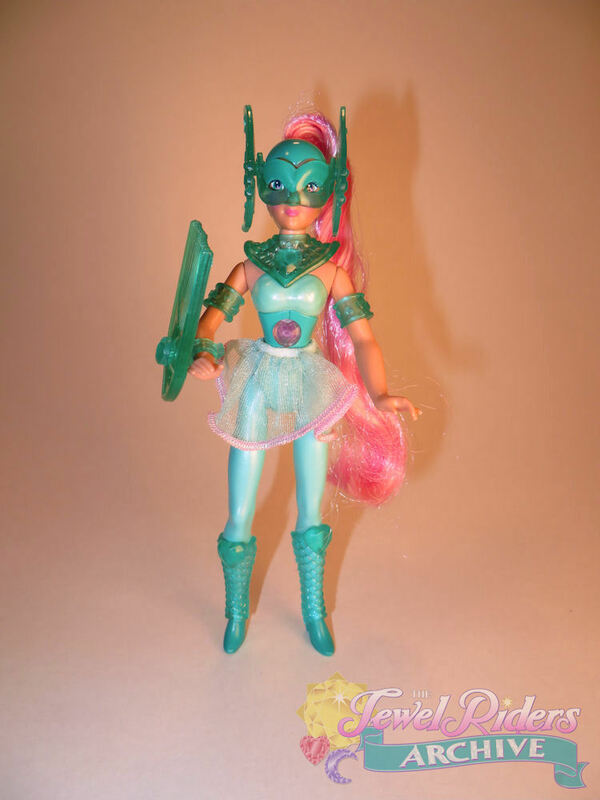 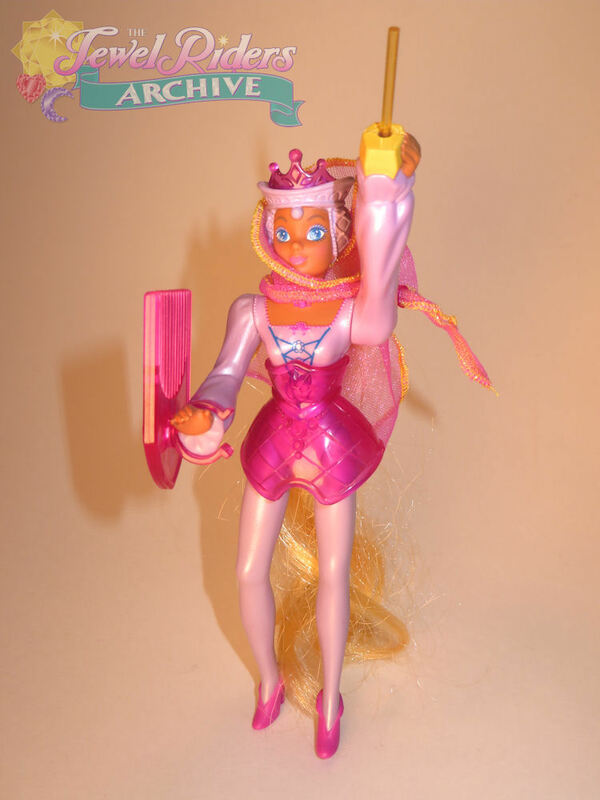 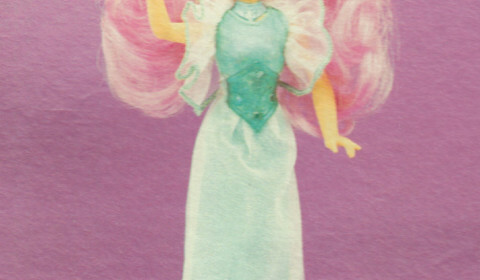 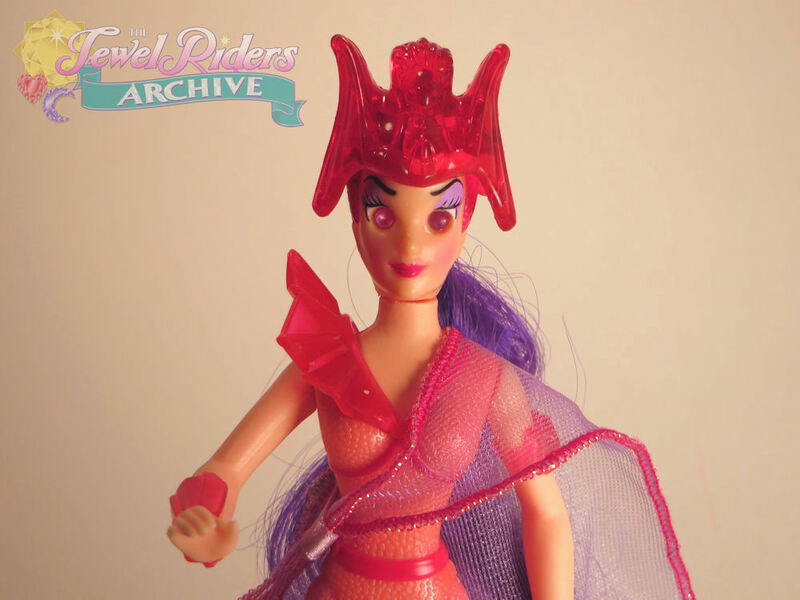 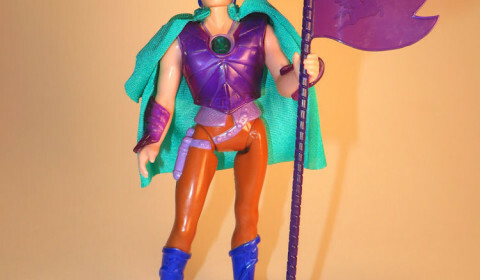 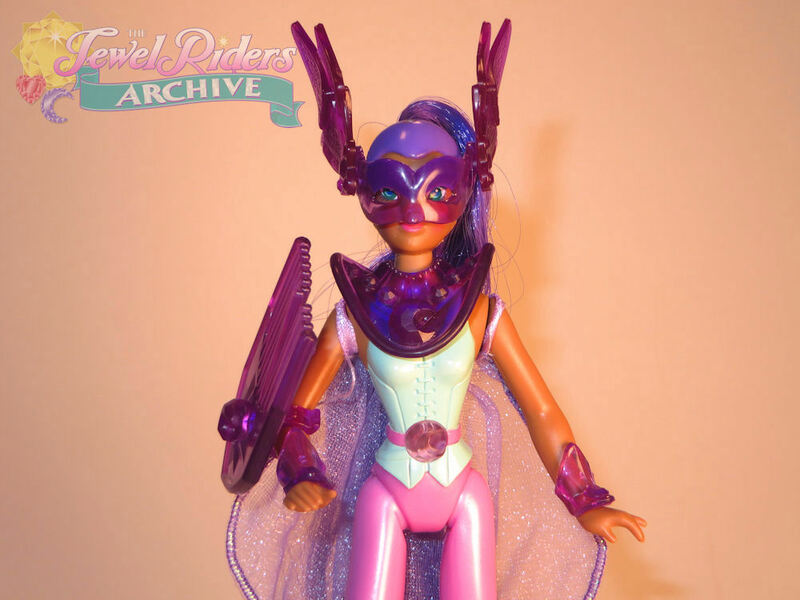 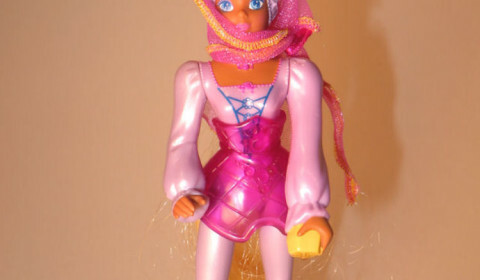 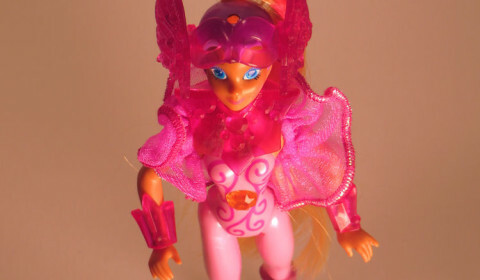 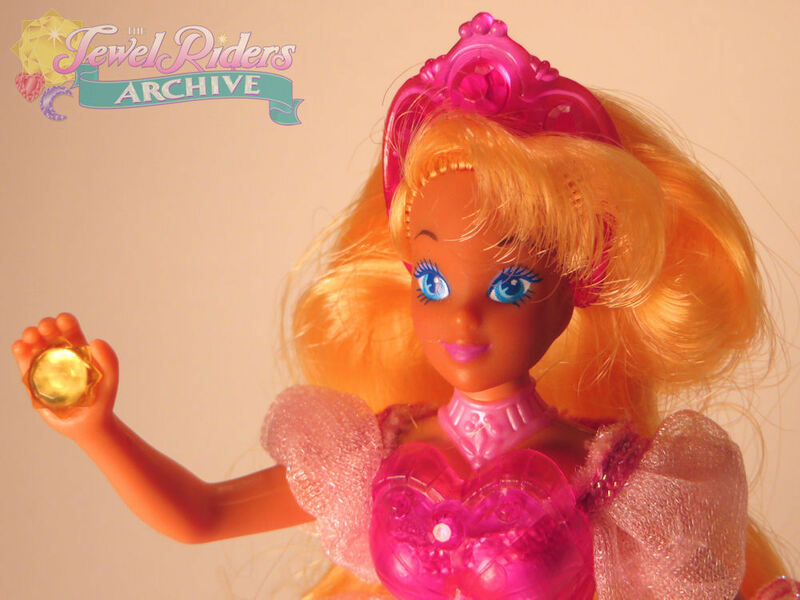 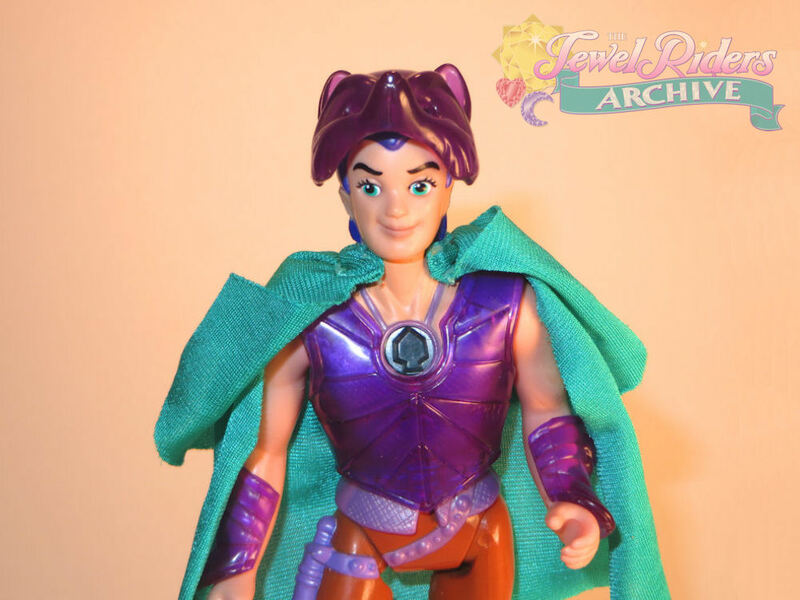 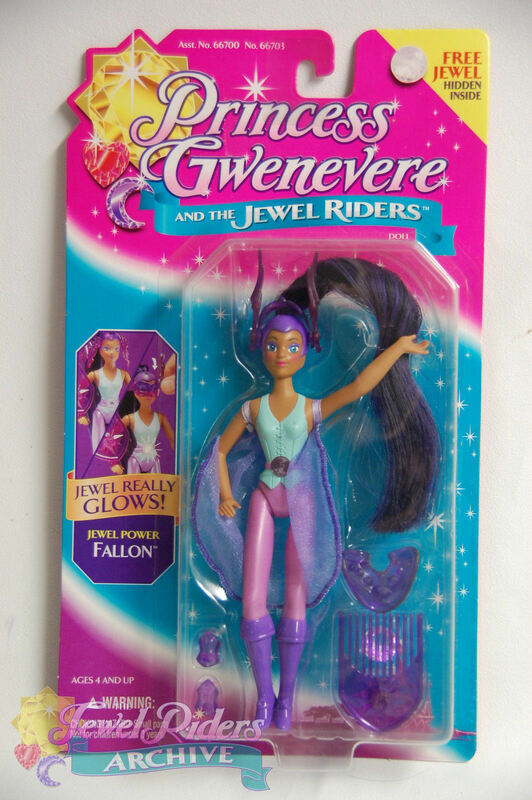 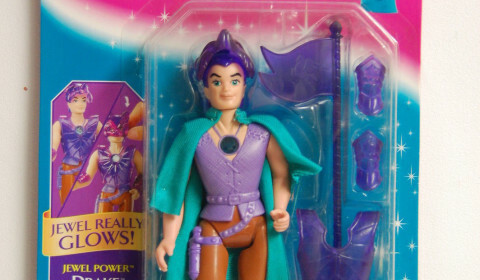 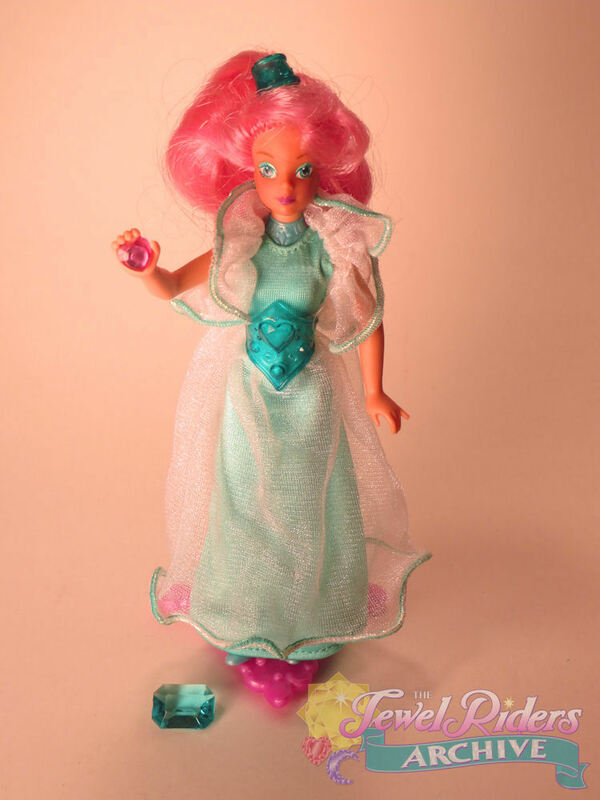 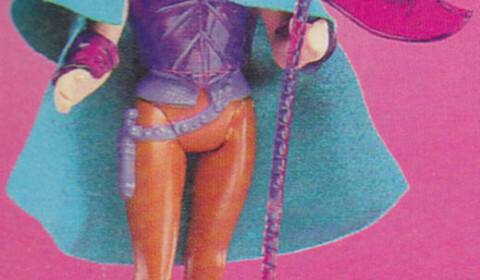 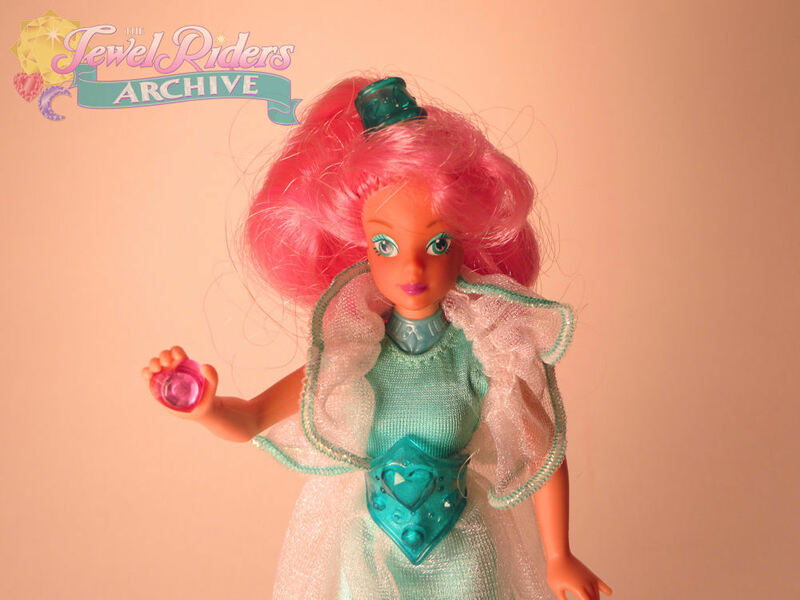 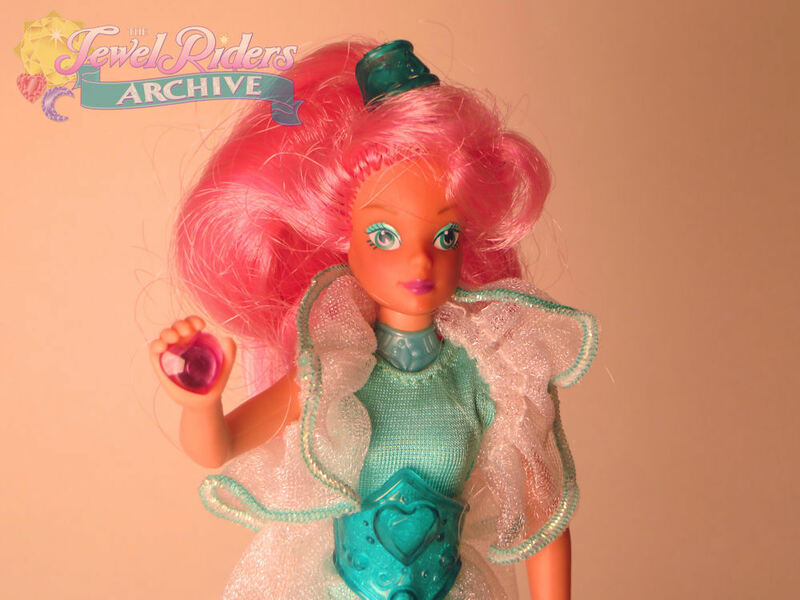 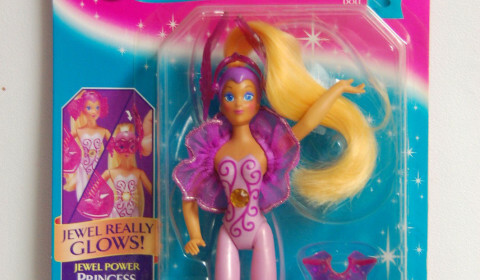 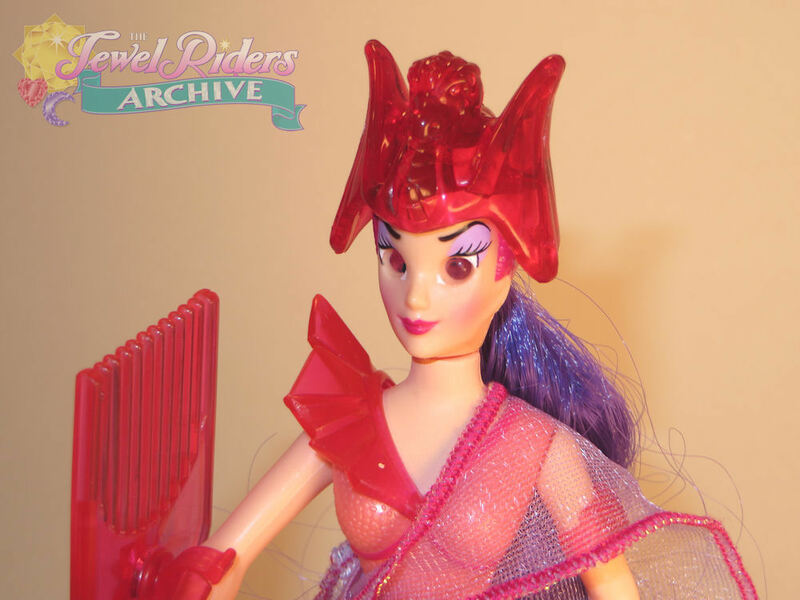 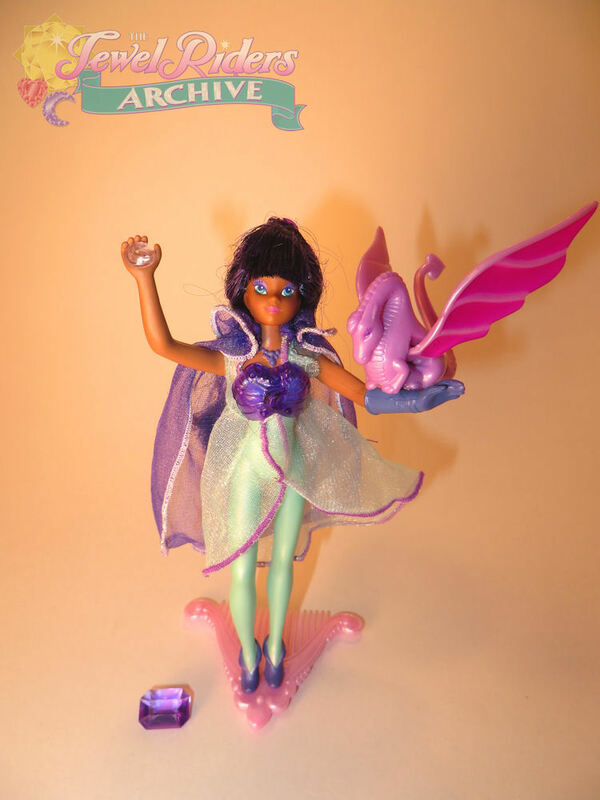 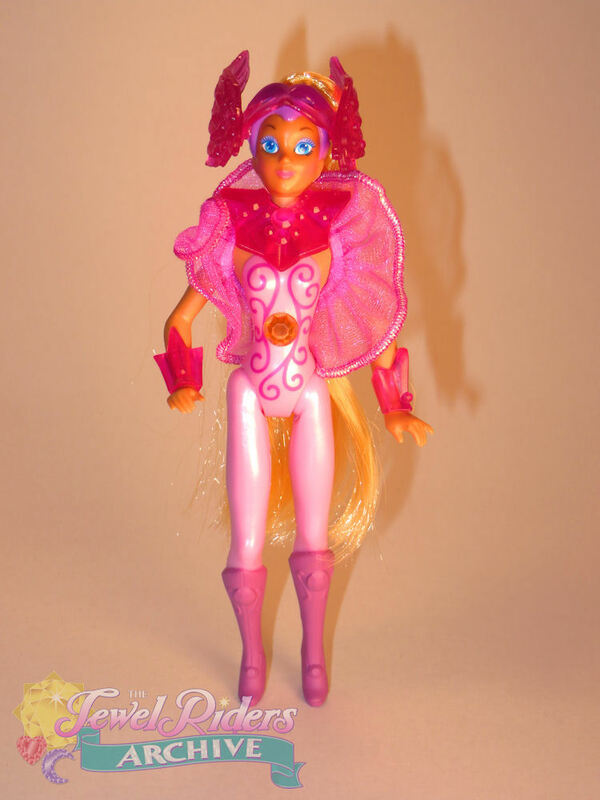 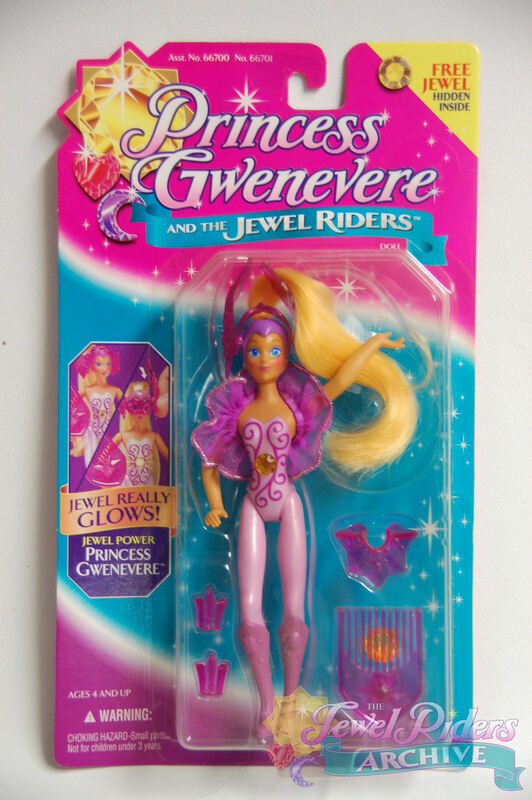 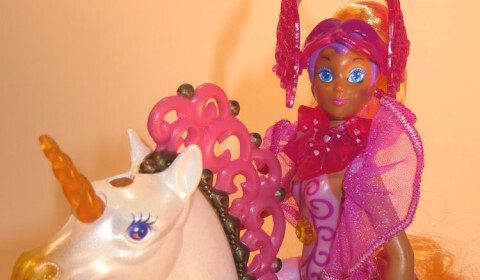 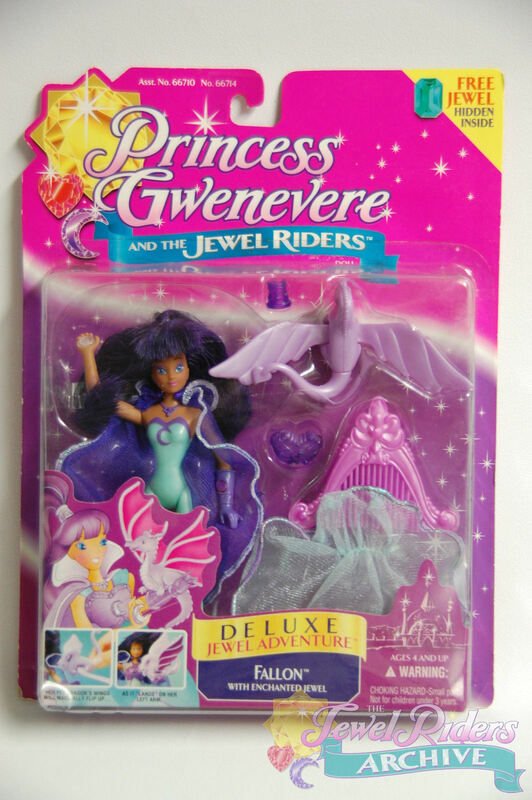 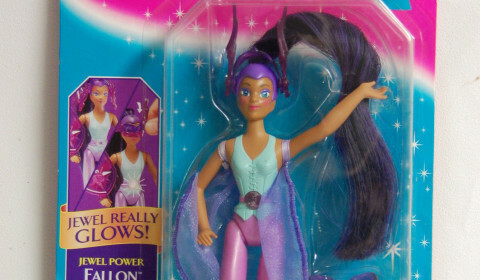 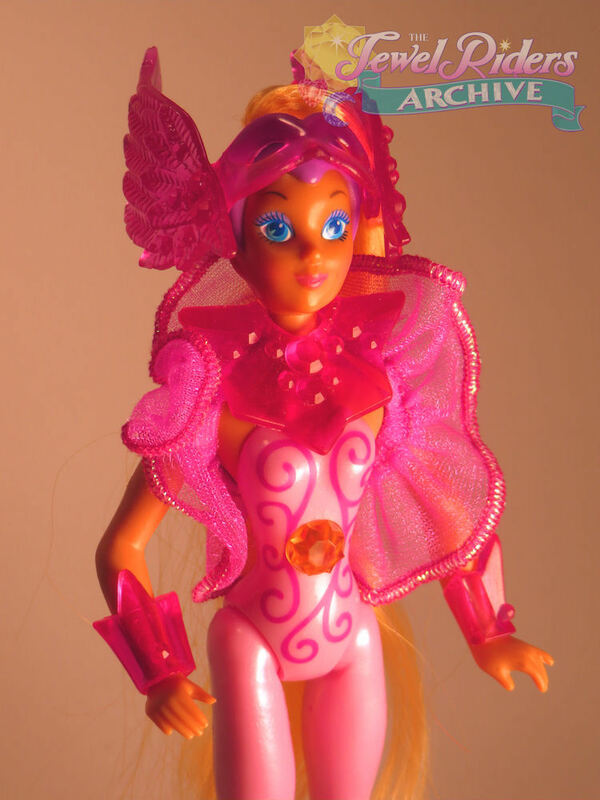 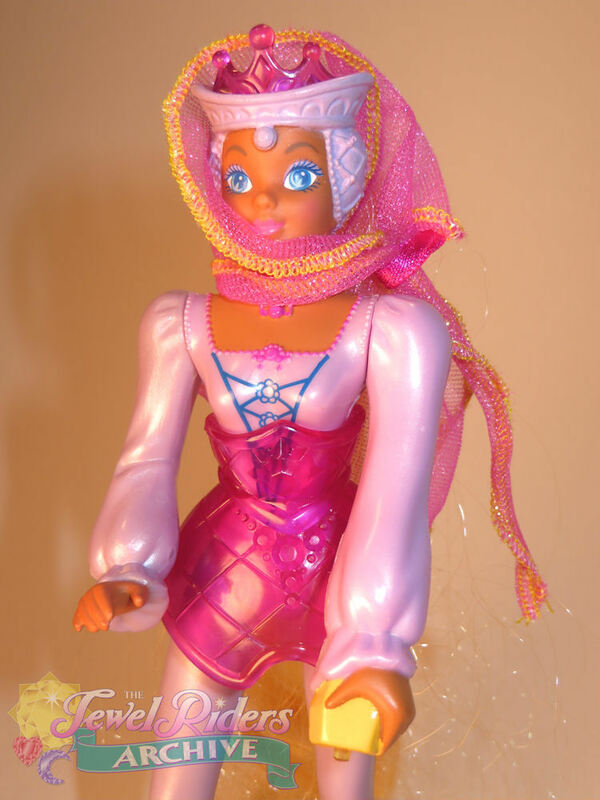 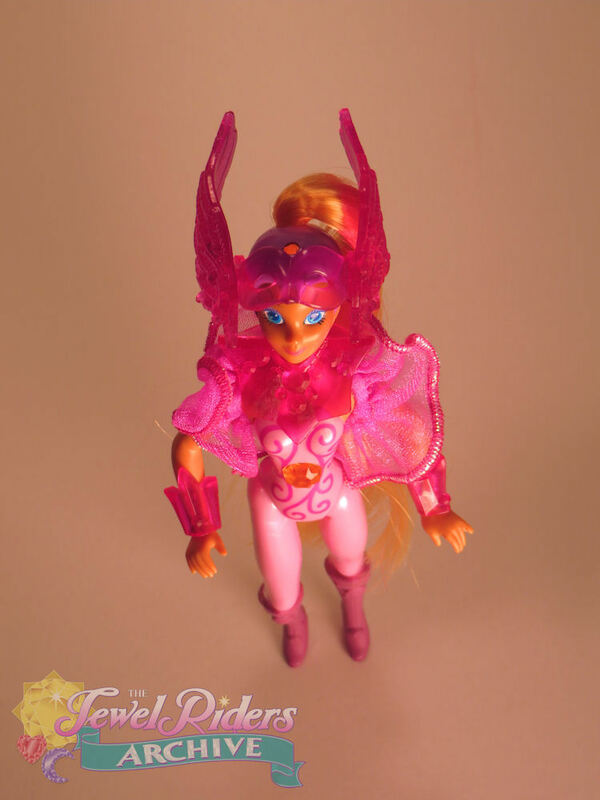 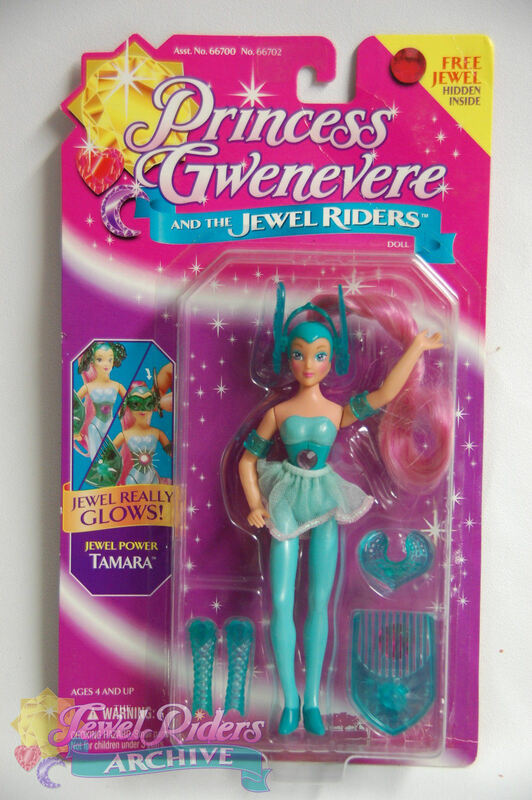 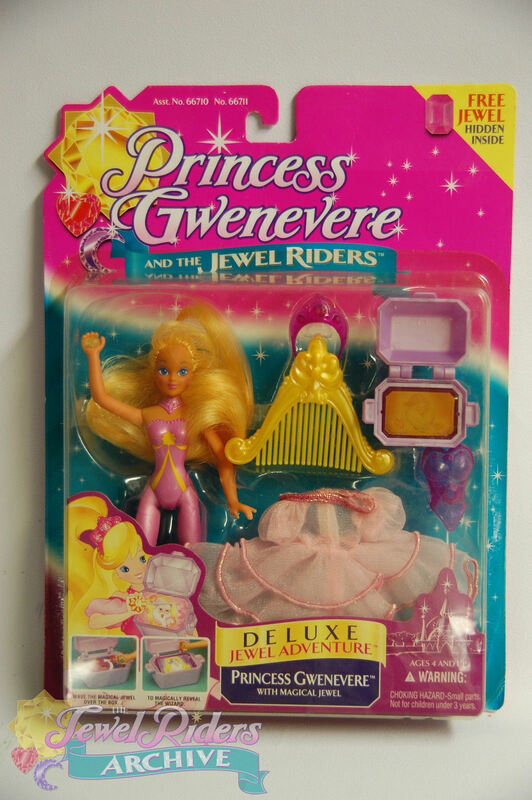 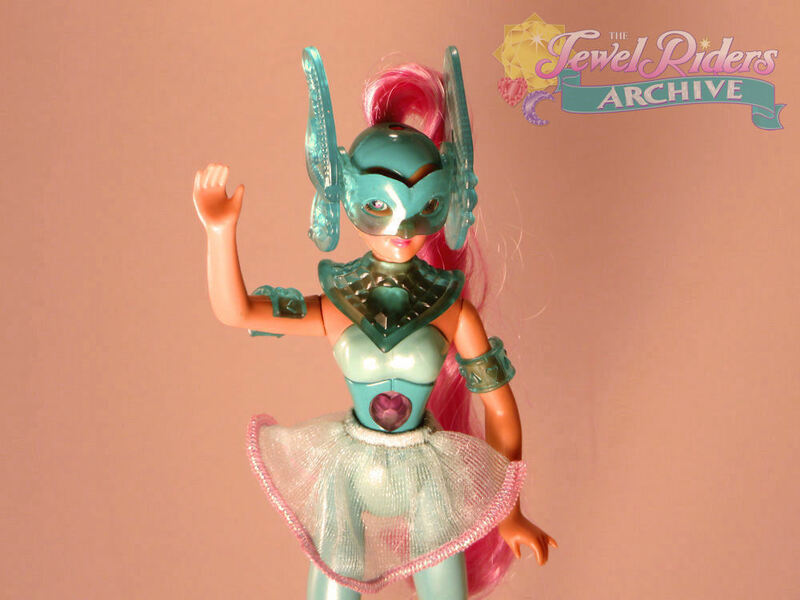 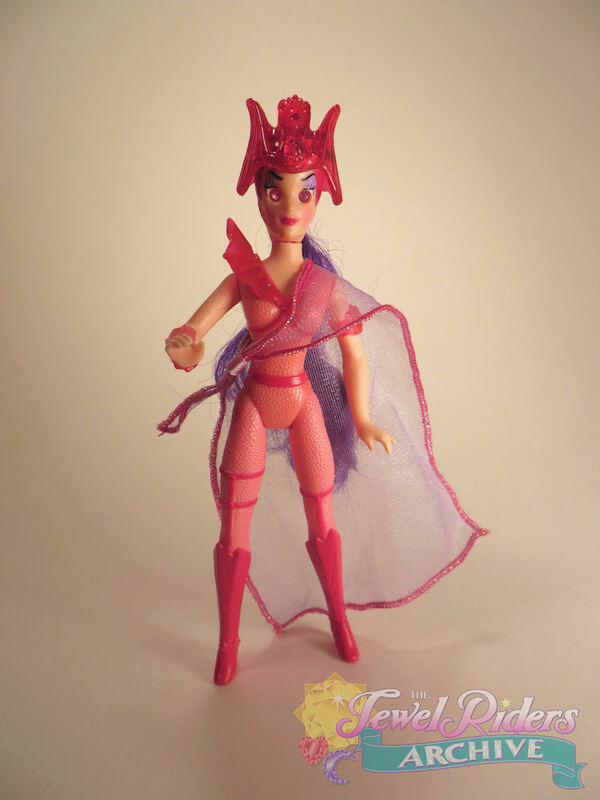 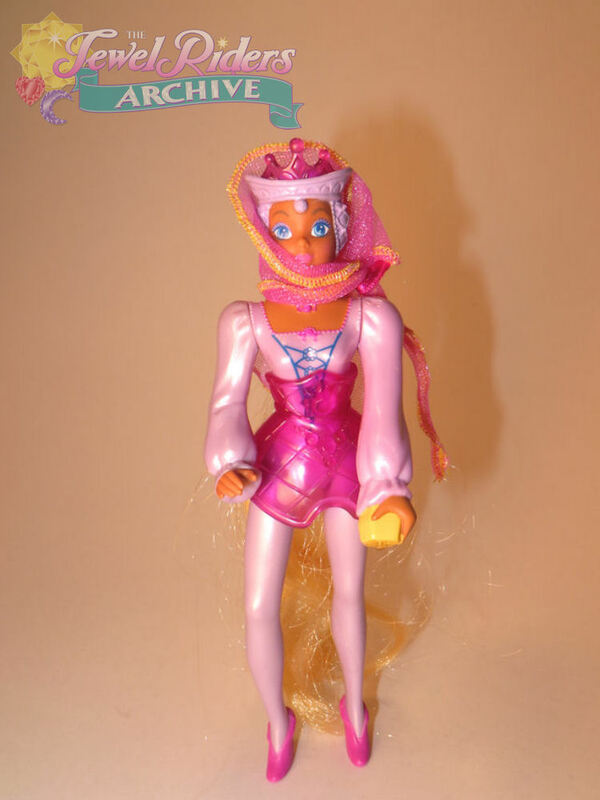 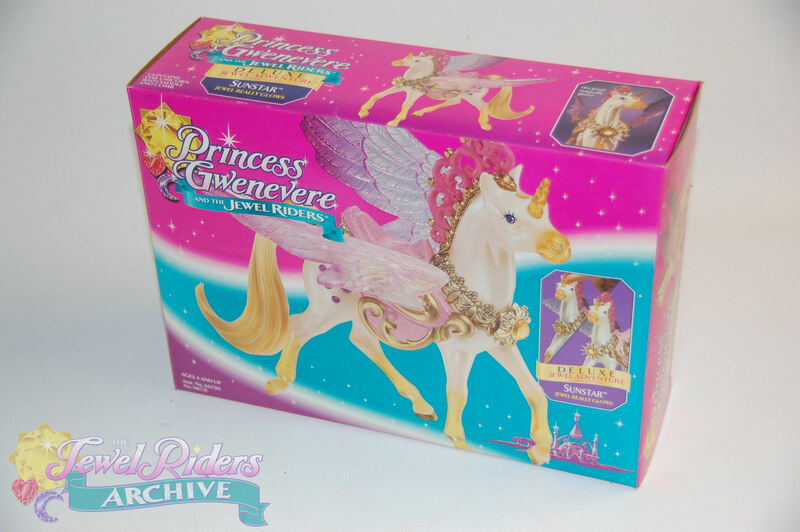 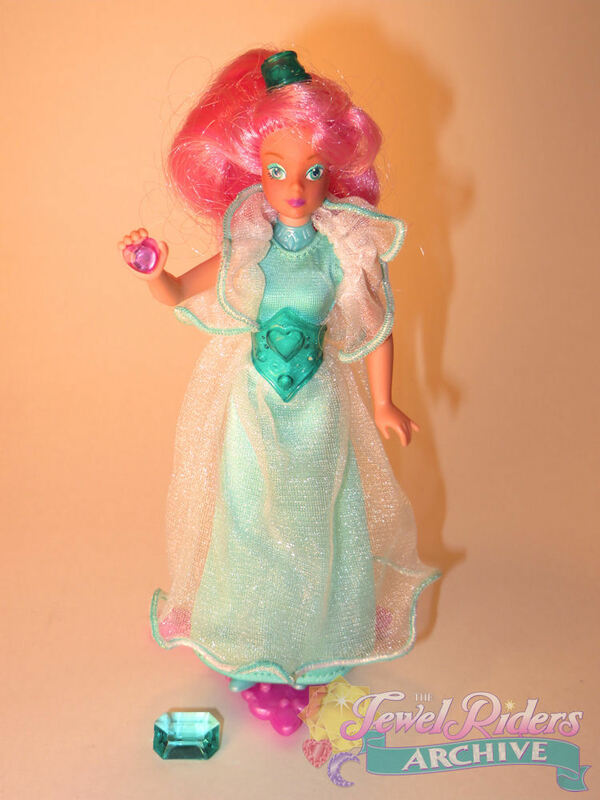 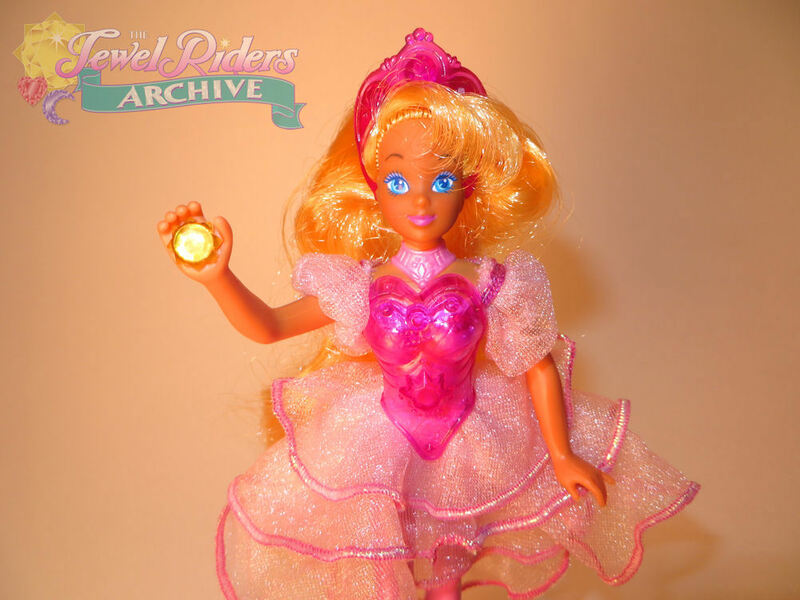 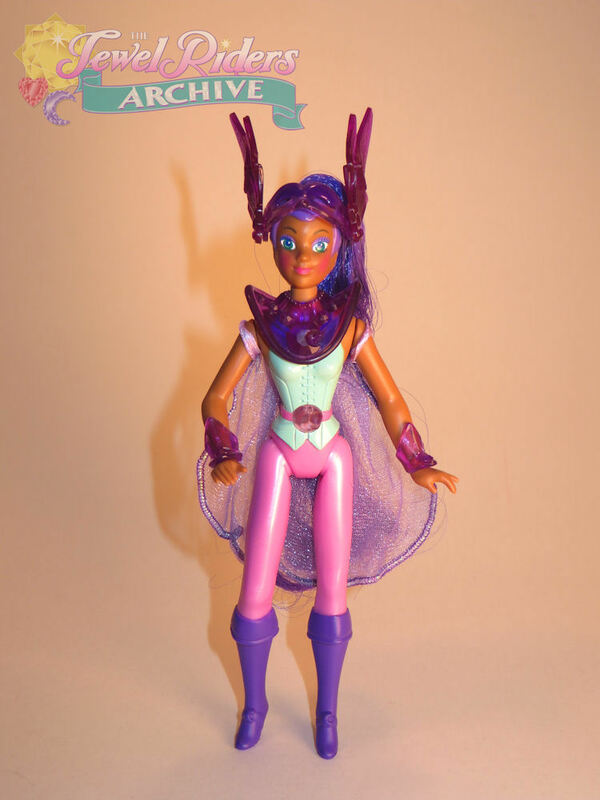 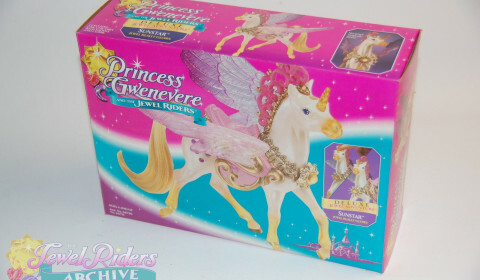 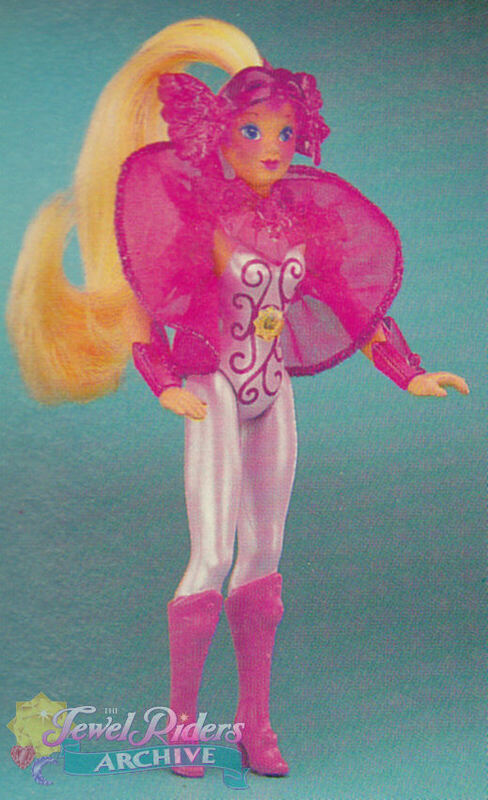 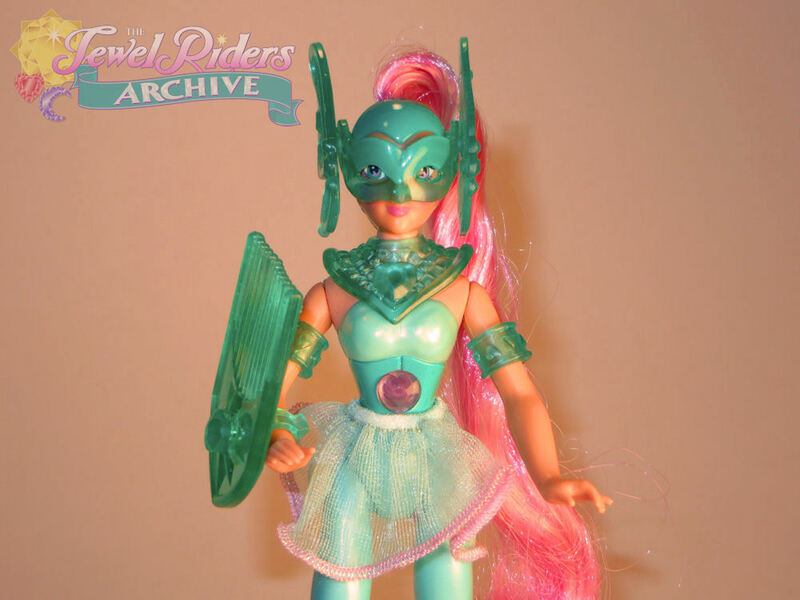 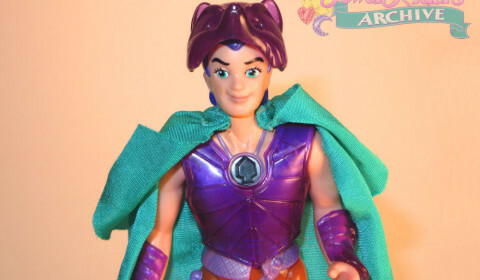 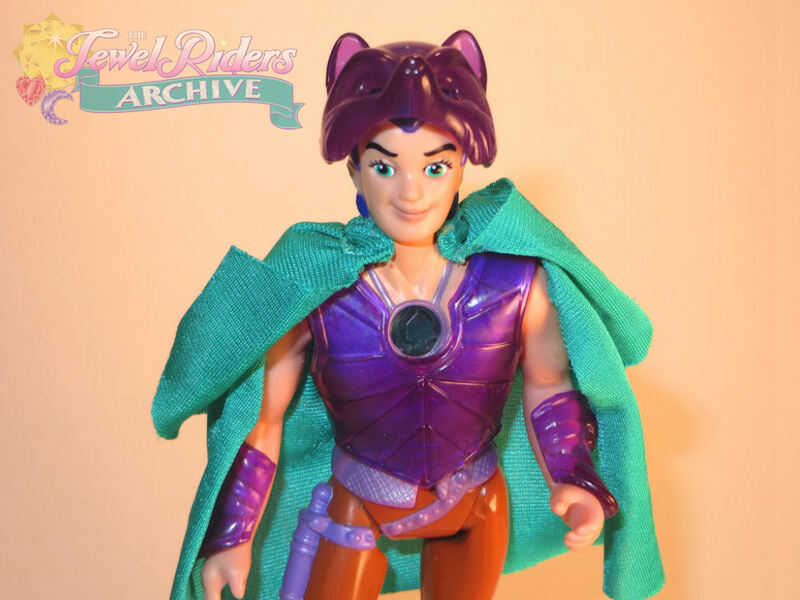 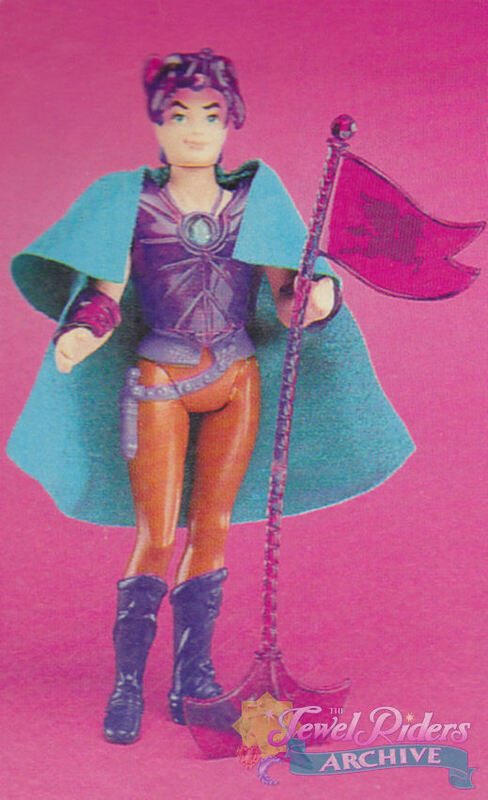 The Princess Gwenevere and the Jewel Riders doll line arrived to retailer shelves in the Fall of 1995. 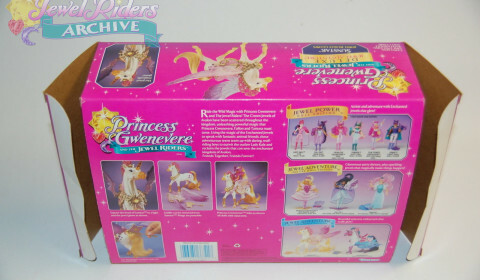 Examples of known stores that carried the toys included Wal-Mart, Target, K-Mart, KB Toys, JC Penney, and Toys R Us. 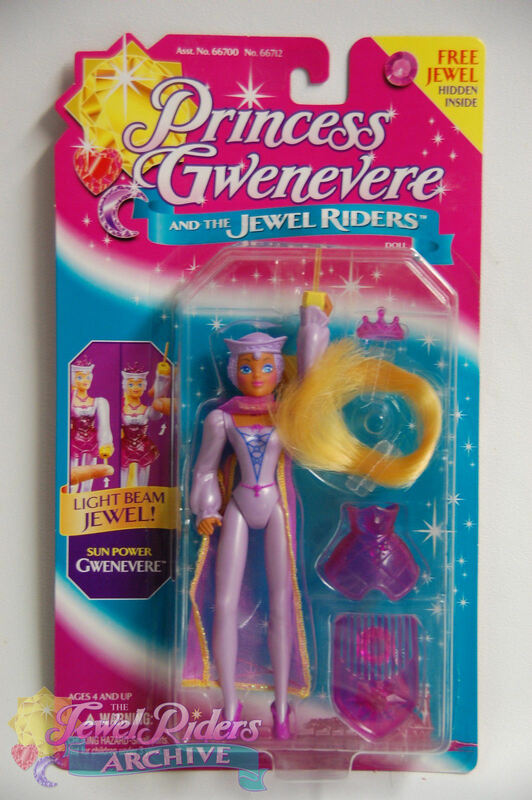 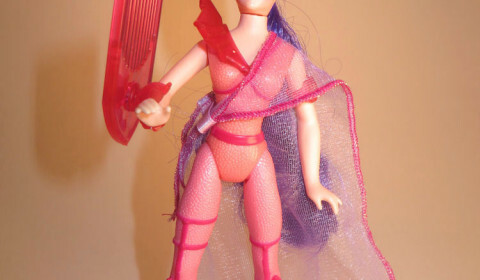 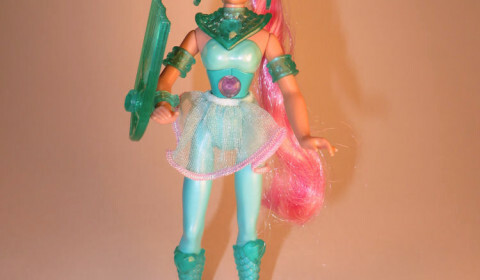 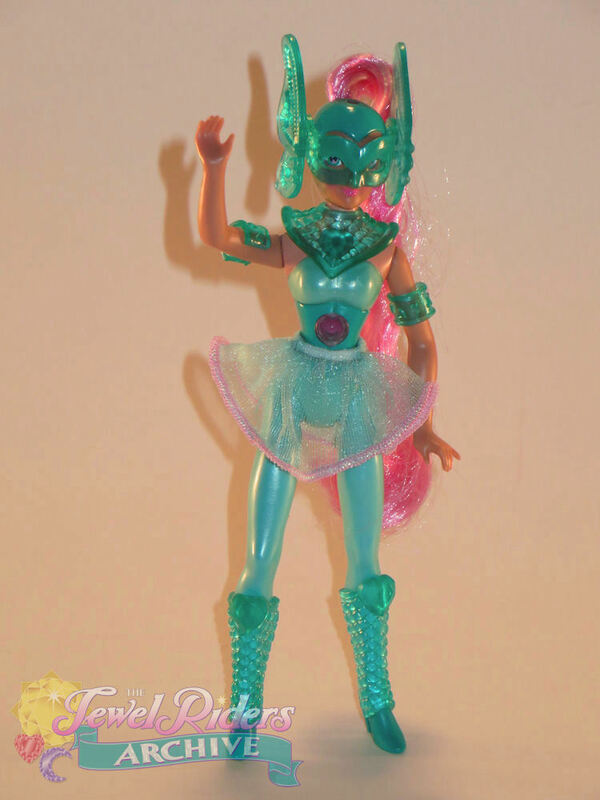 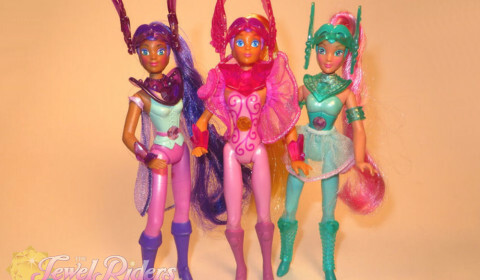 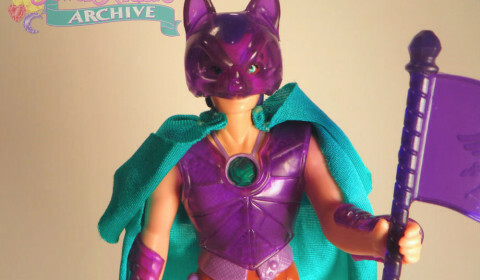 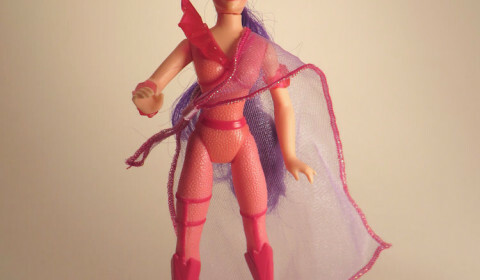 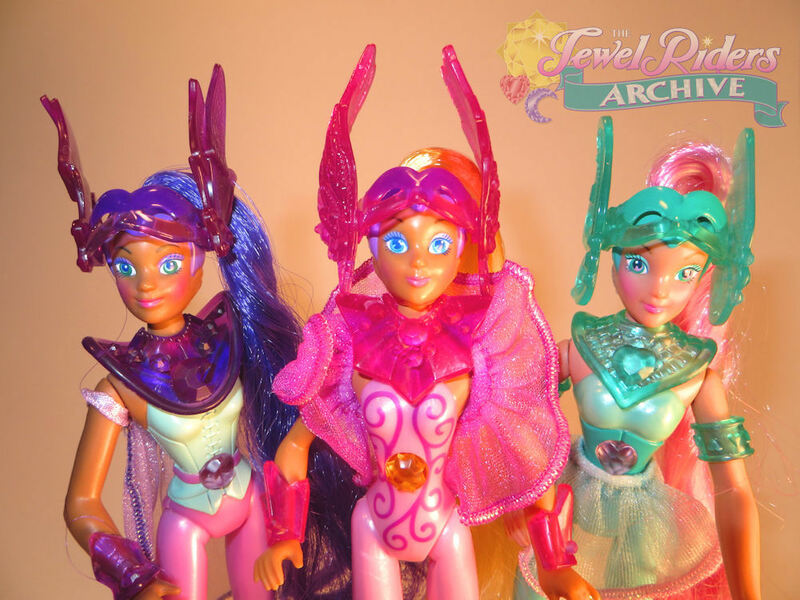 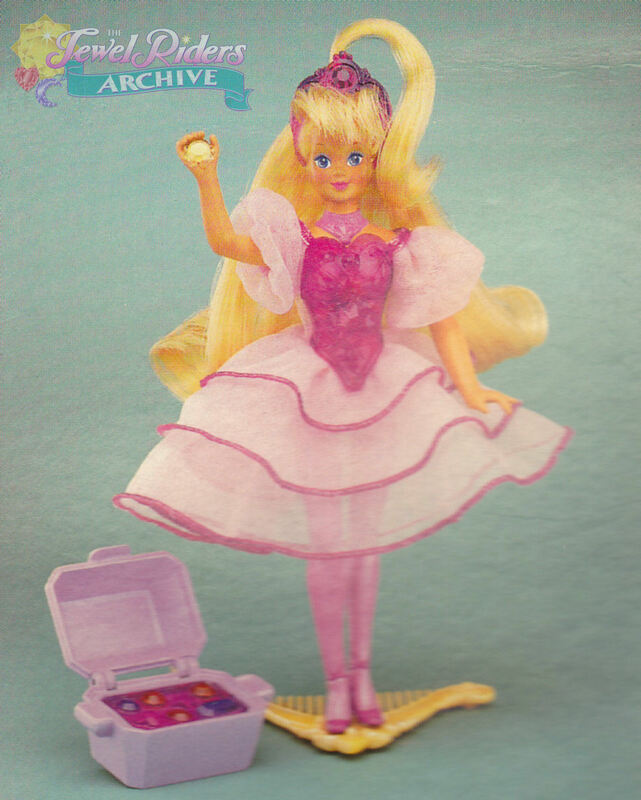 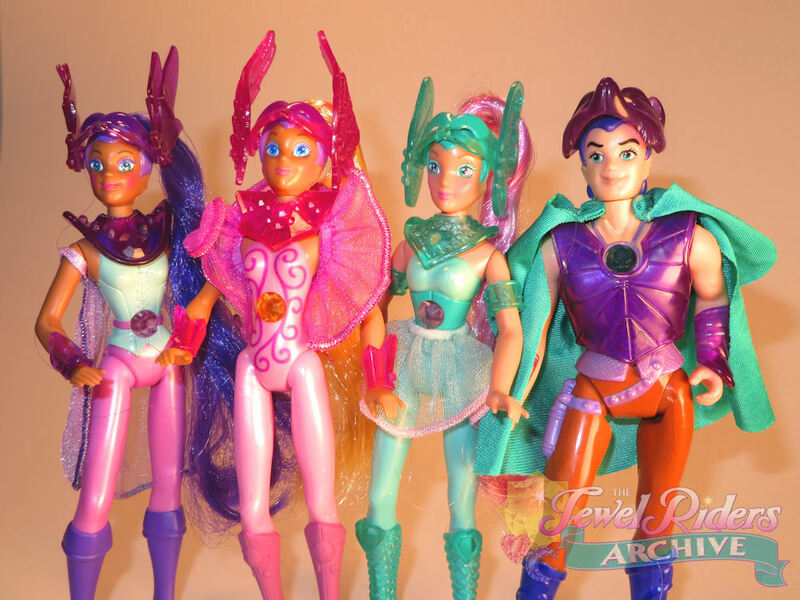 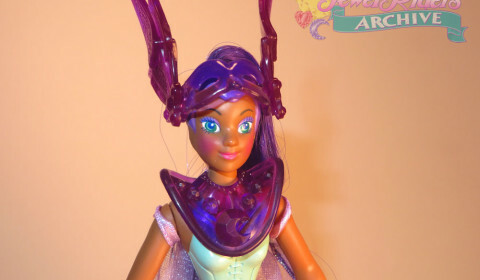 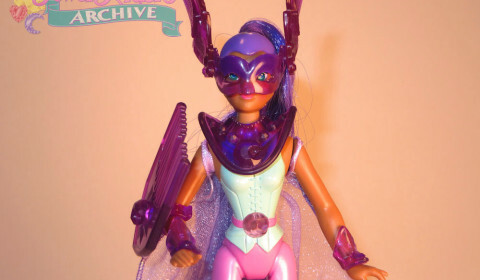 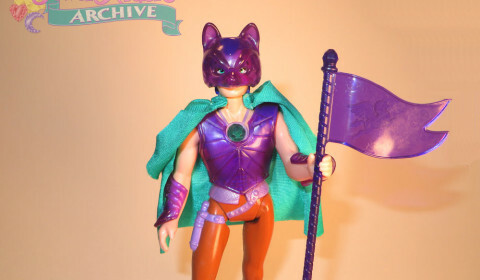 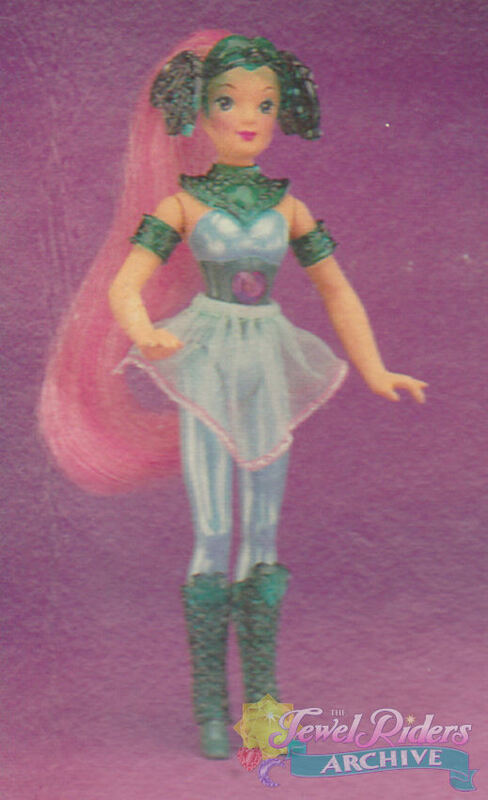 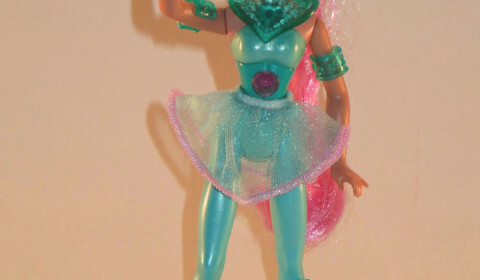 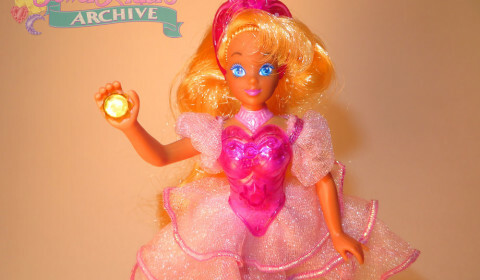 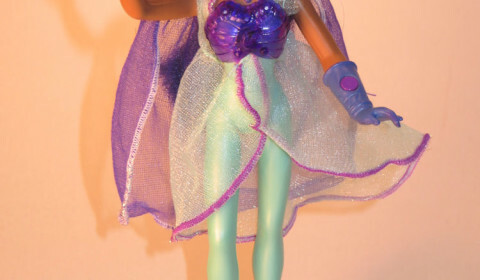 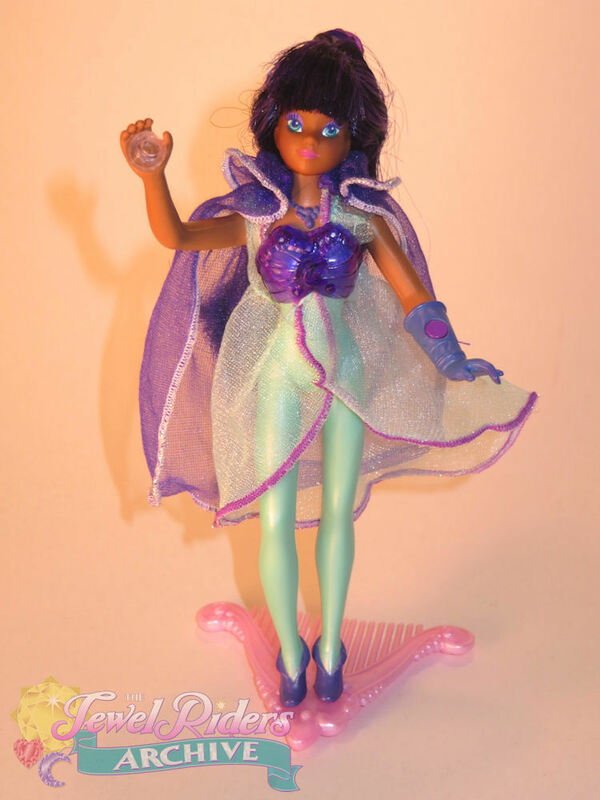 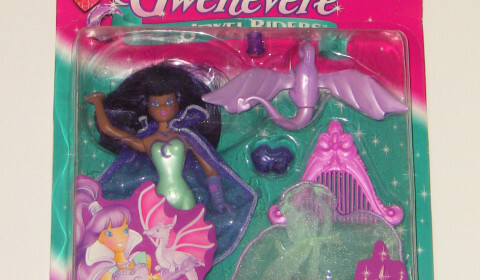 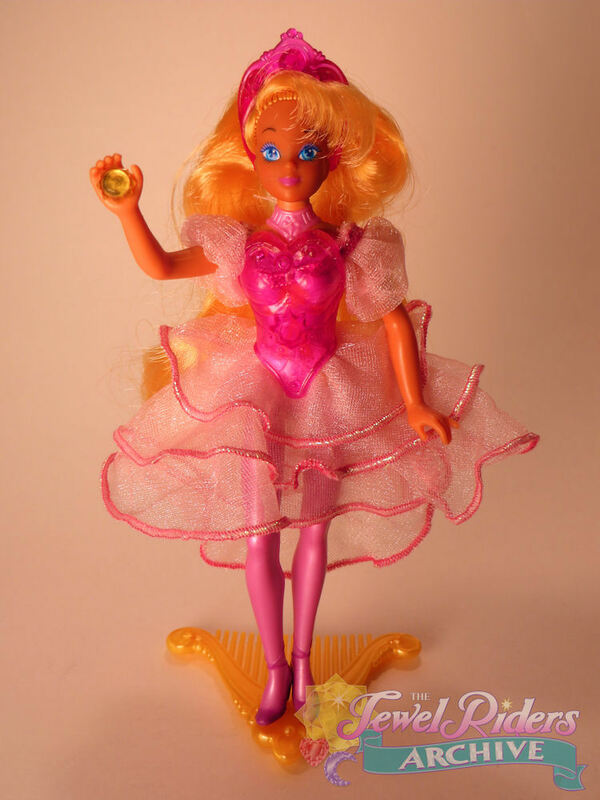 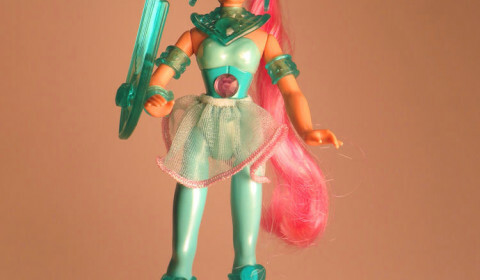 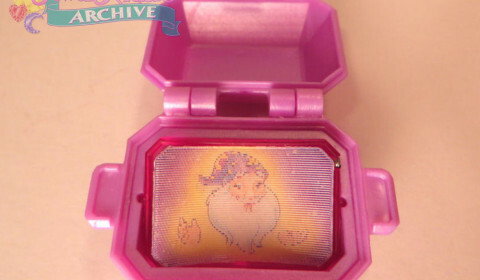 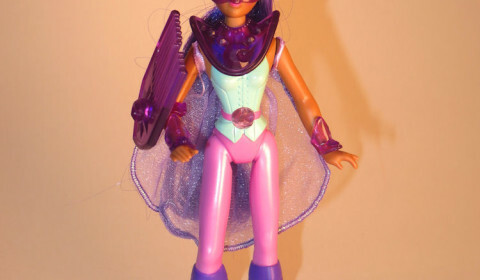 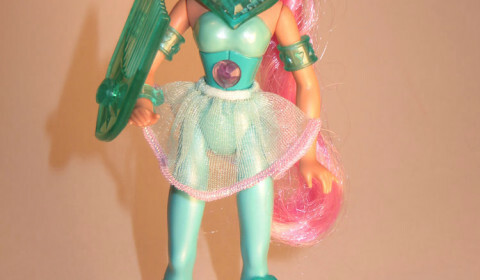 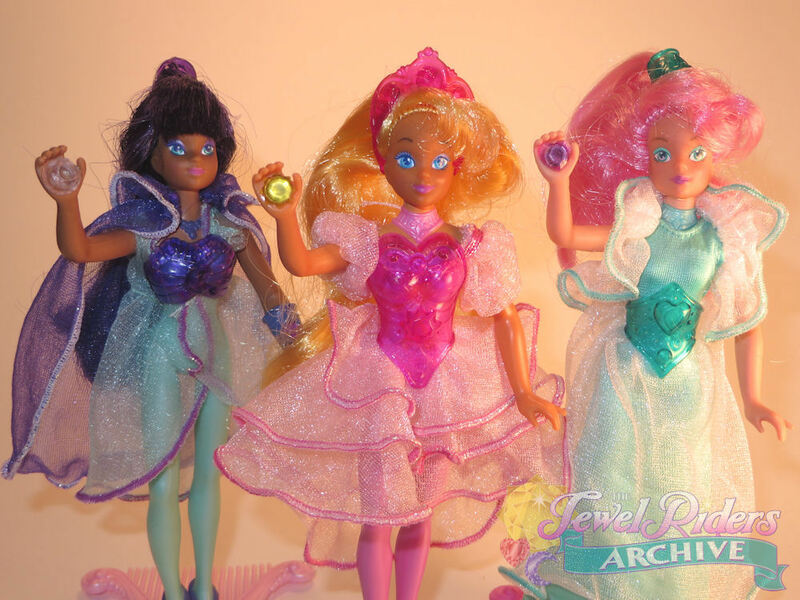 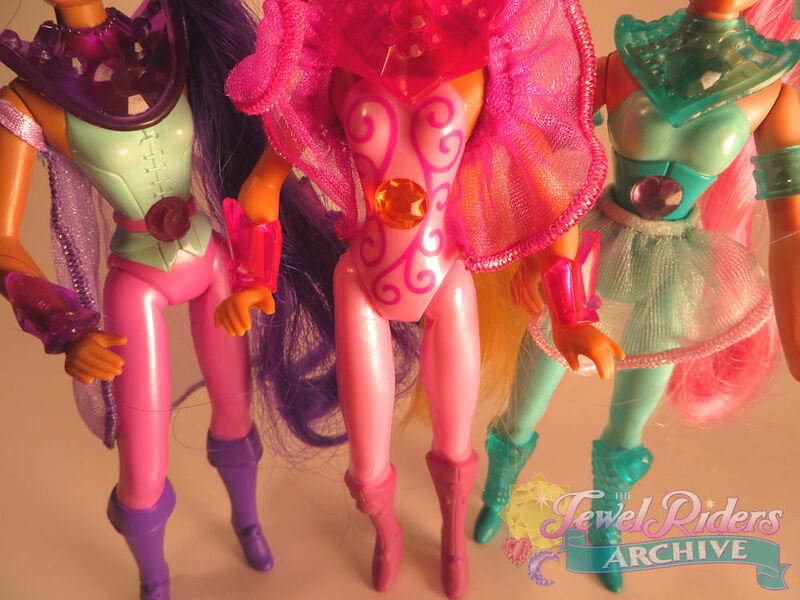 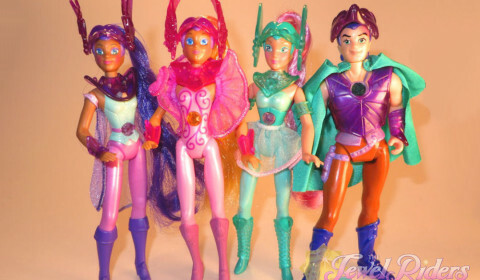 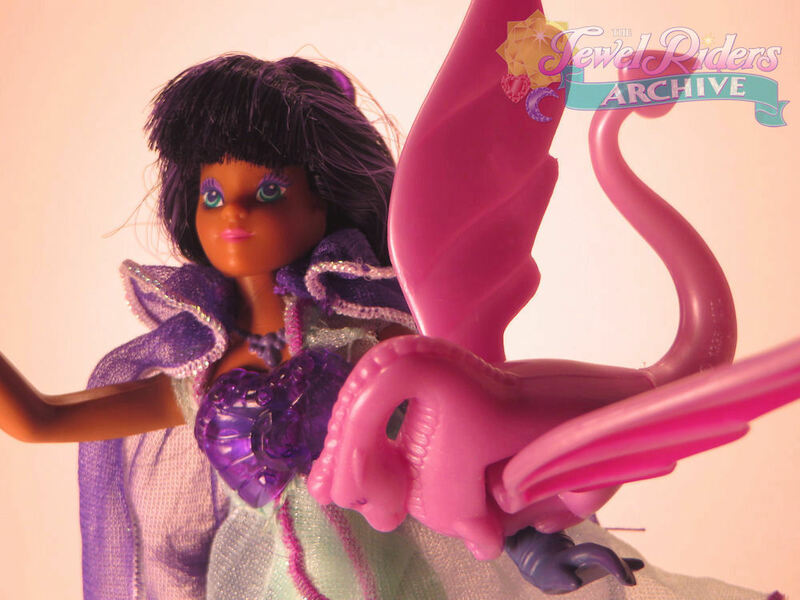 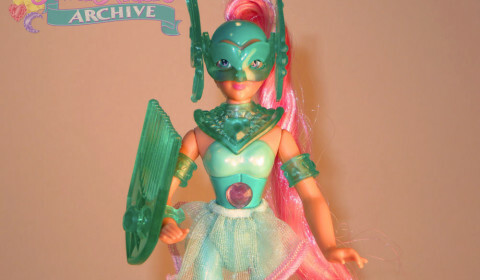 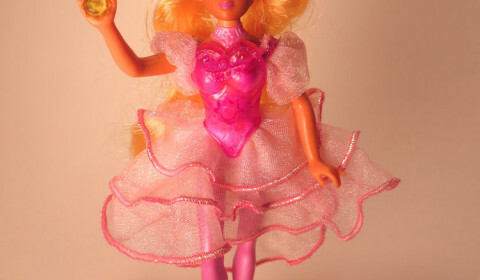 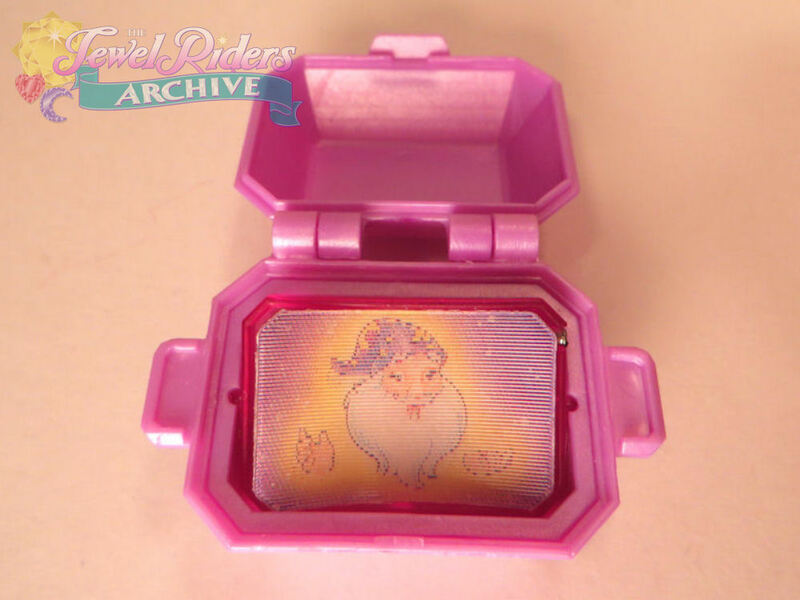 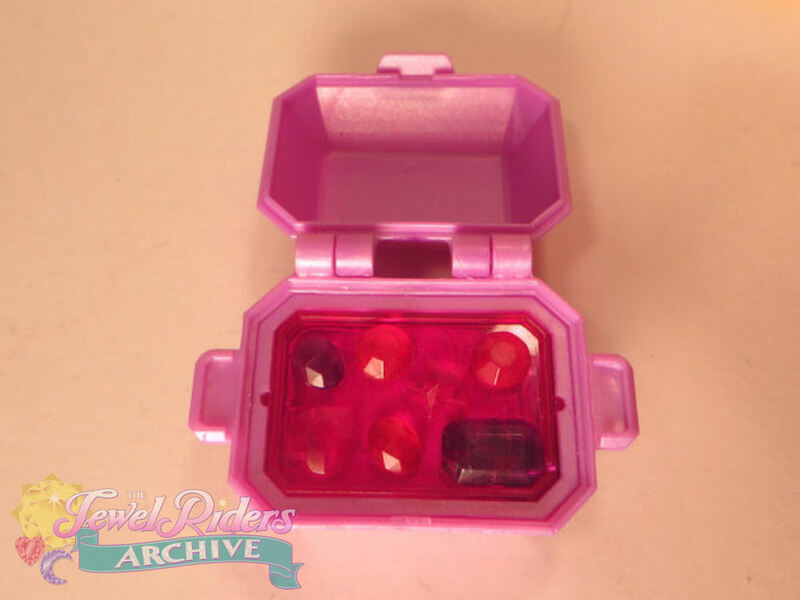 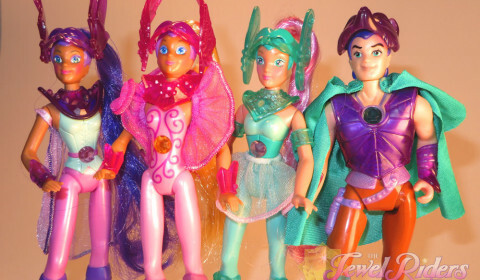 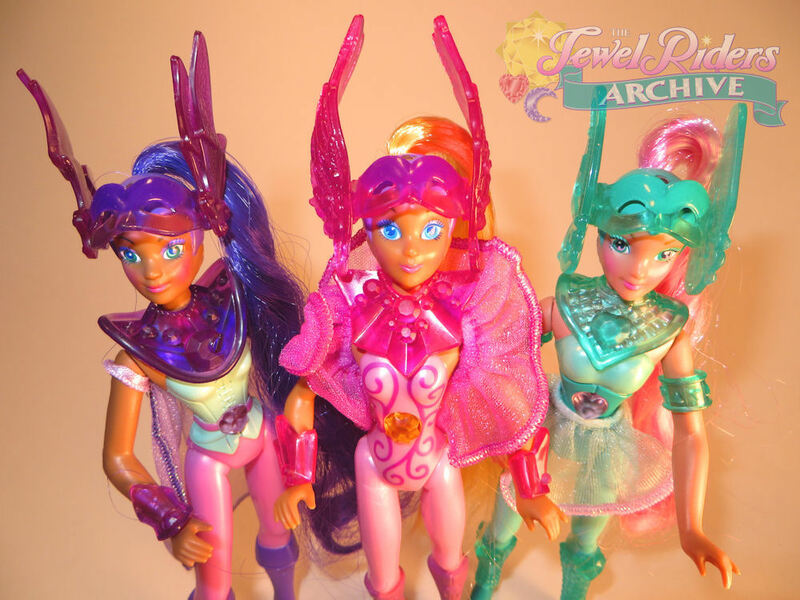 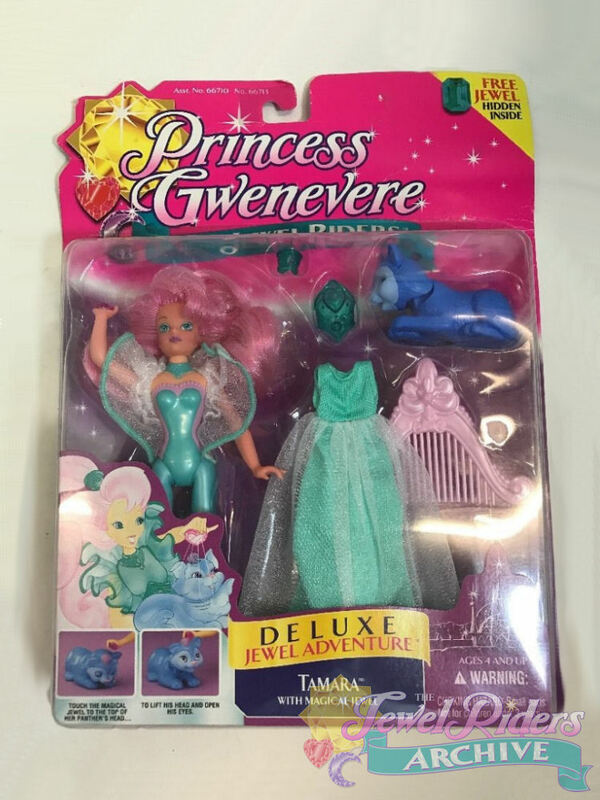 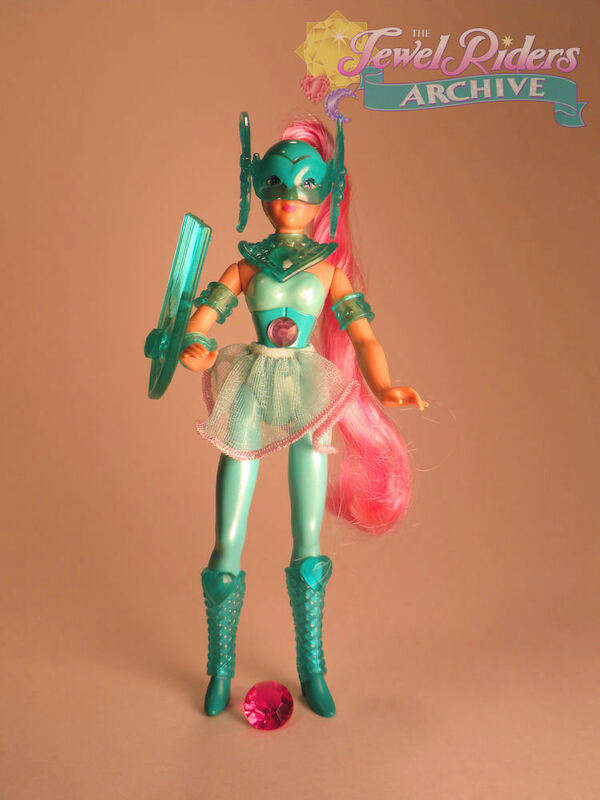 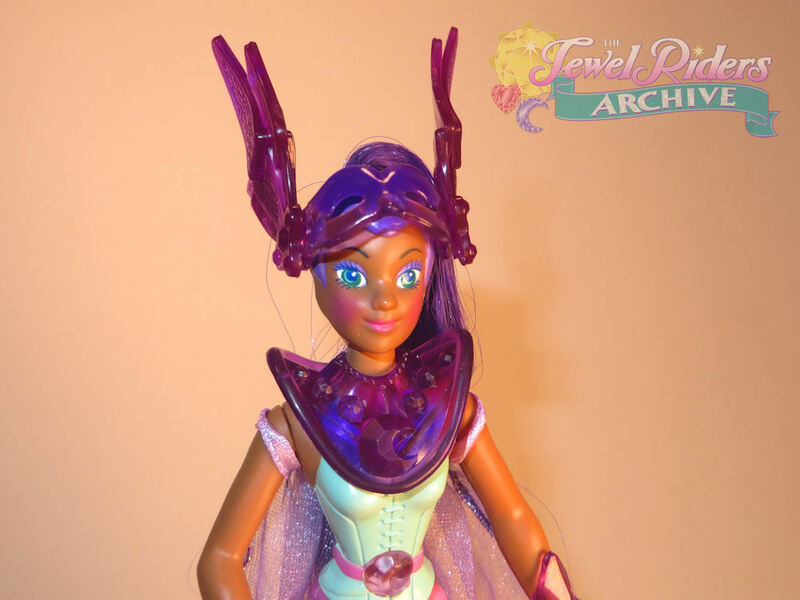 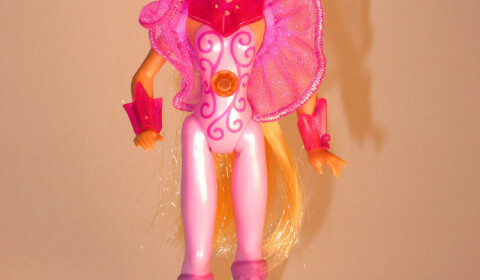 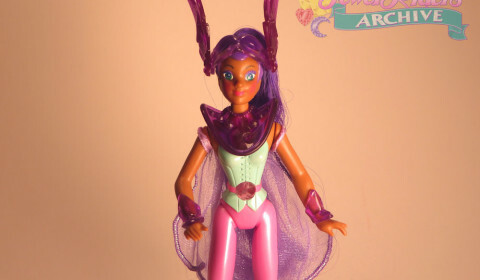 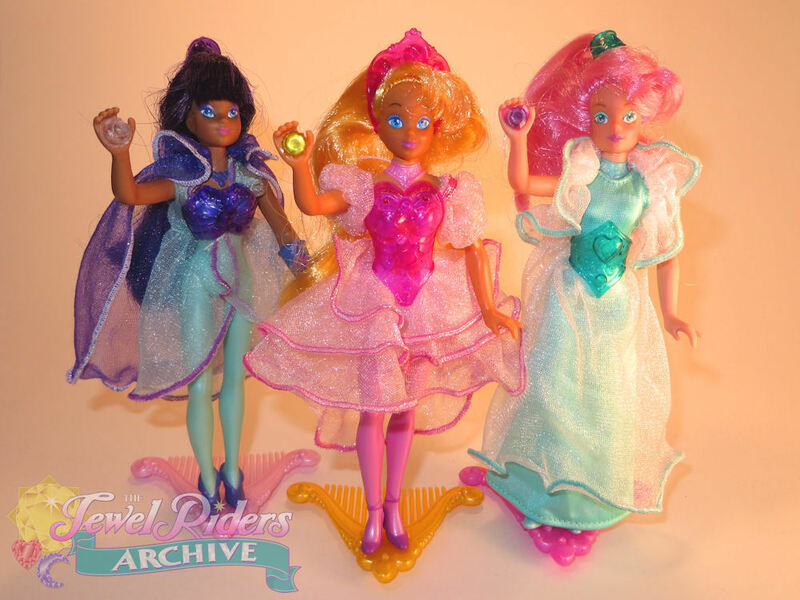 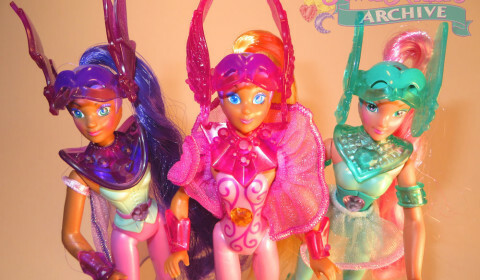 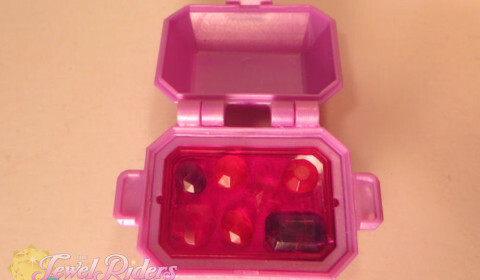 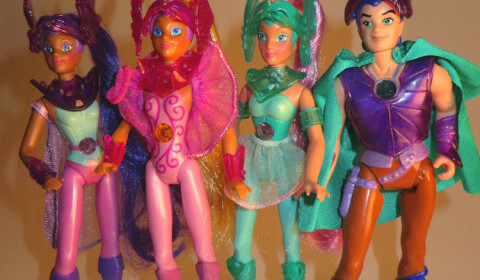 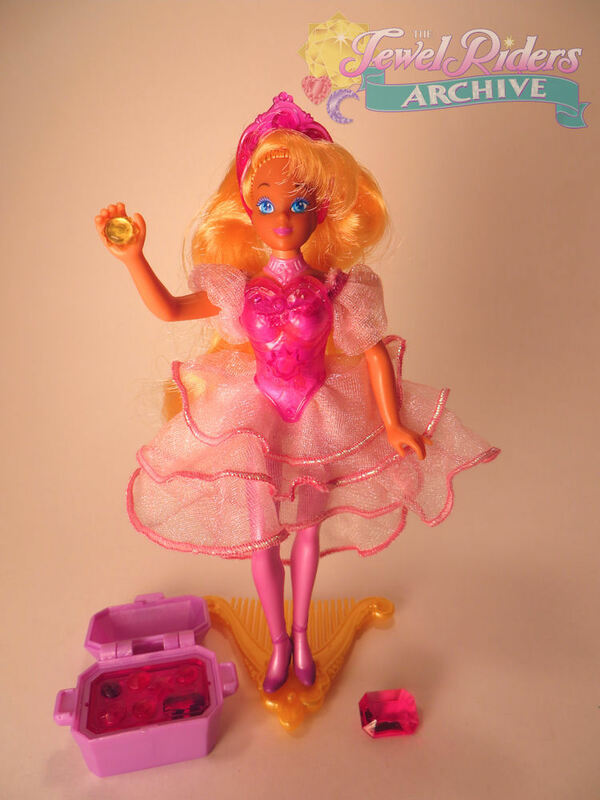 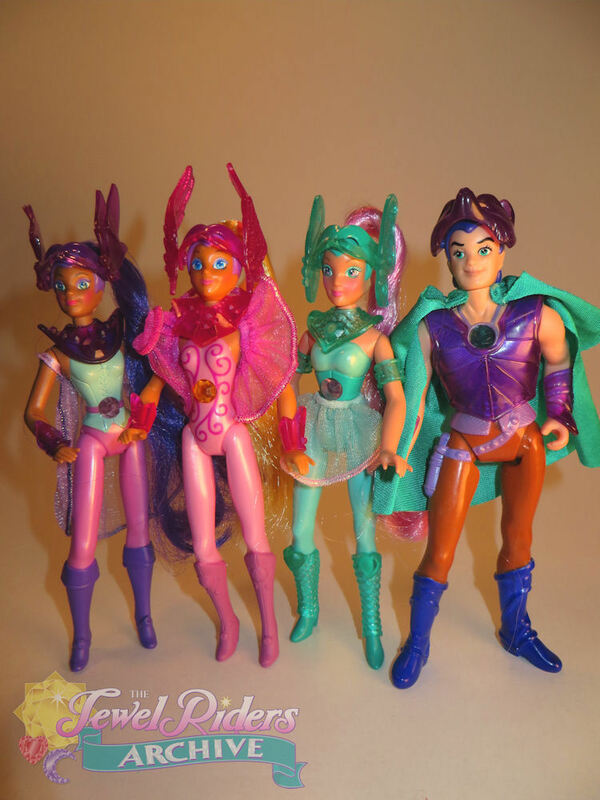 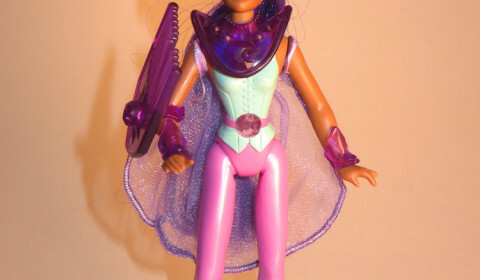 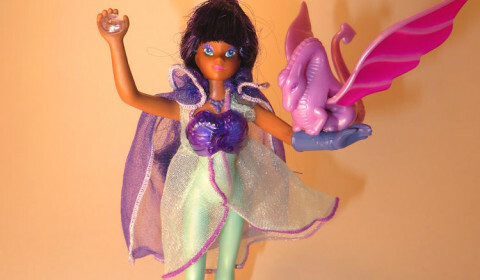 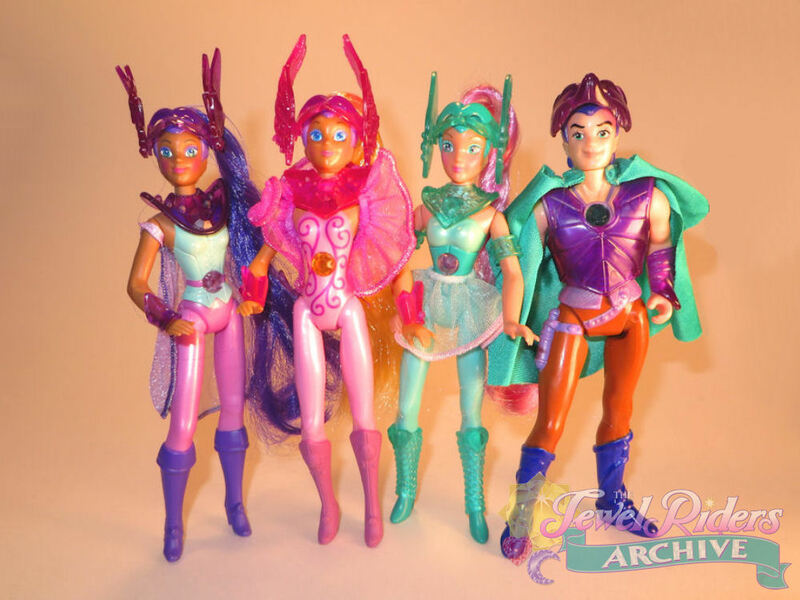 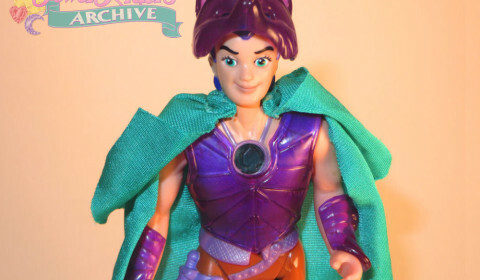 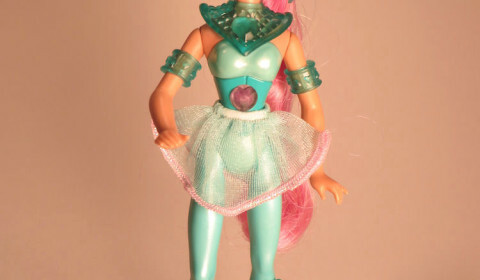 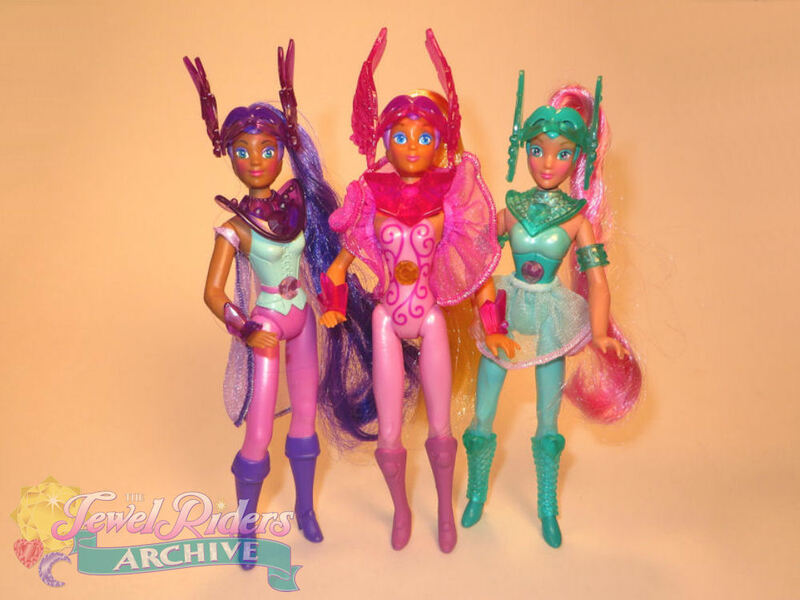 The second line was called “Jewel Adventure – Deluxe Doll Edition.” These were deluxe dolls of Gwenevere, Fallon, and Tamara that included cloth dresses, snap-on armor pieces, fully rooted hair, and accessories that worked with the magnets hidden in the girls’ jewels or arms. 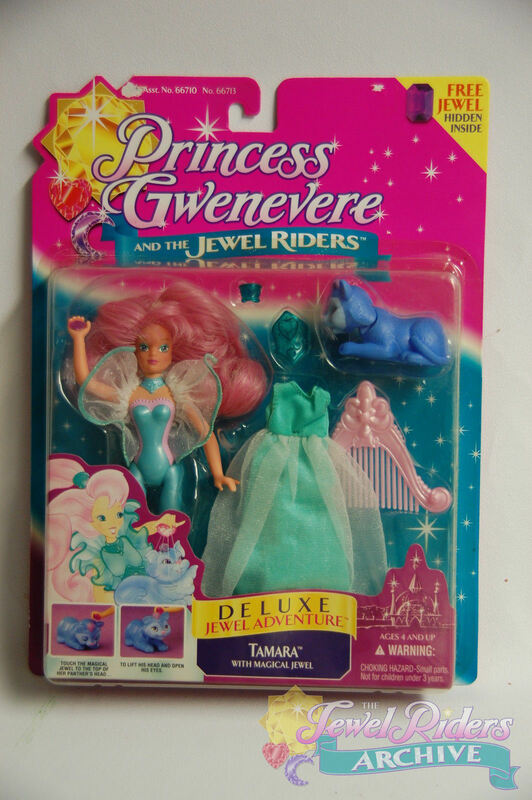 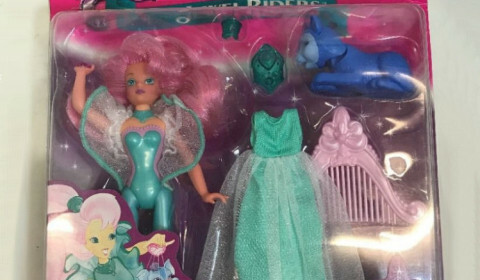 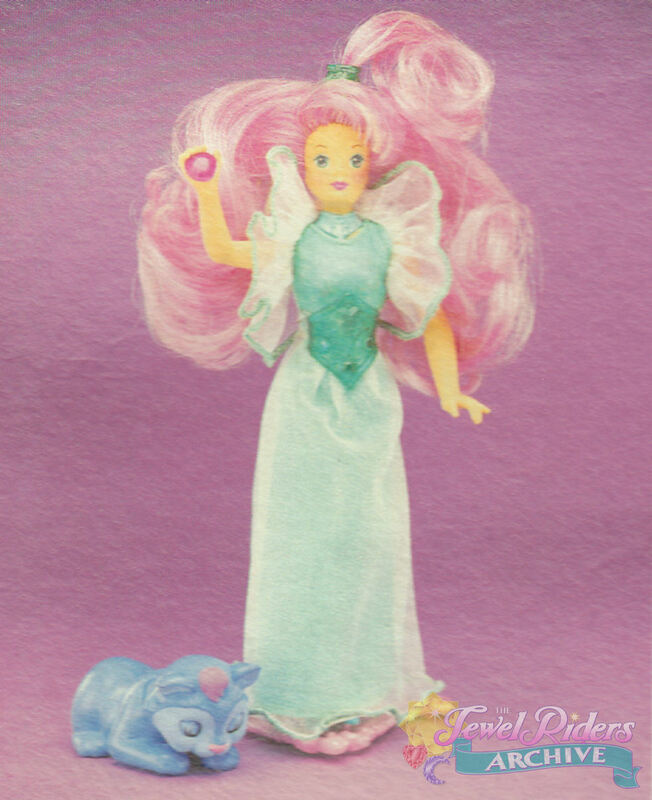 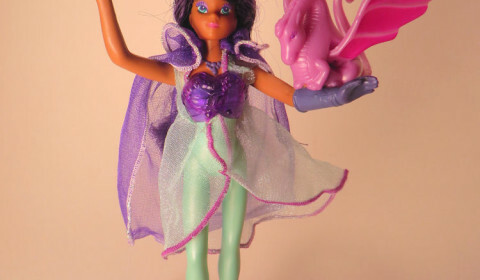 Gwenevere included the Jewel Box, Fallon included the little dragon Windy from “The Faery Princess,” and Tamara included Spike. 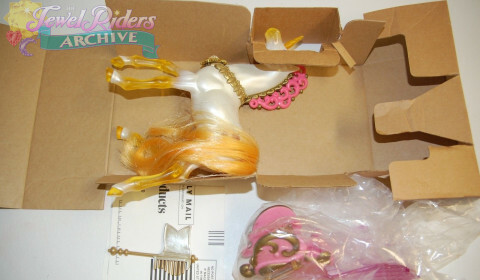 Each of them also included a comb that doubled as a stand, and another hidden jewel in the packaging. 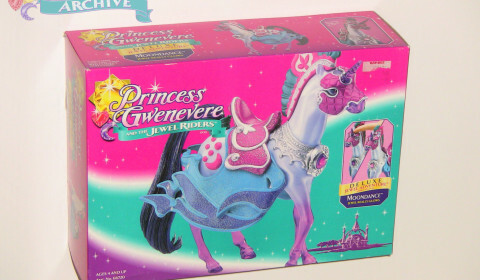 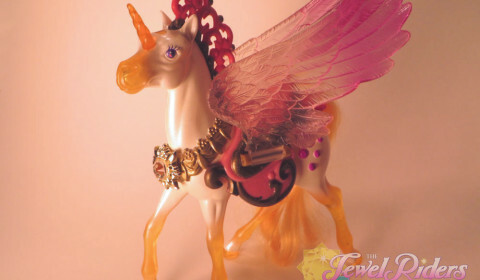 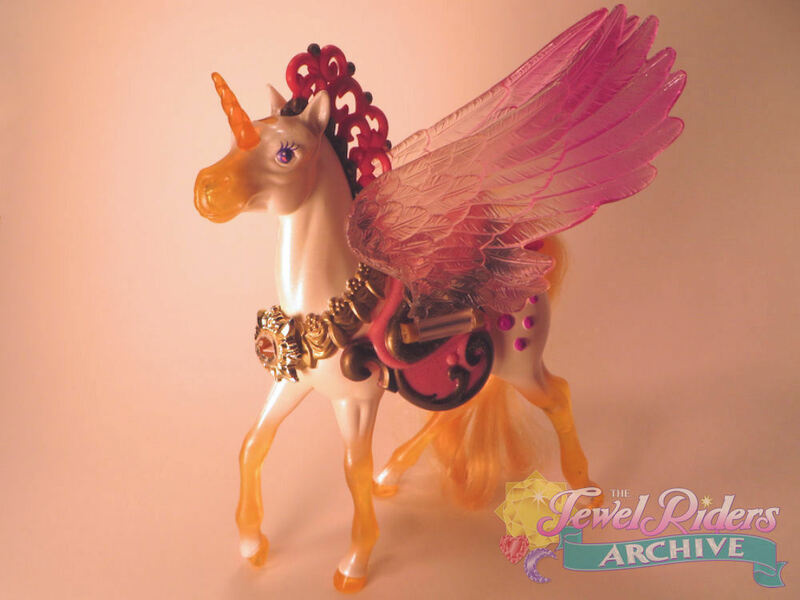 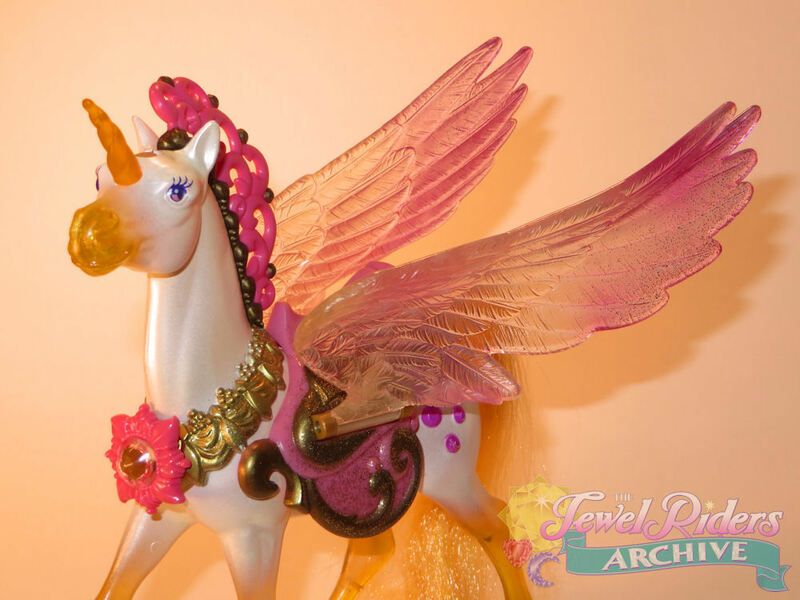 The third line was called “Jewel Adventure – Deluxe Animal Edition.” This line included the unicorns Sunstar and Moondance. 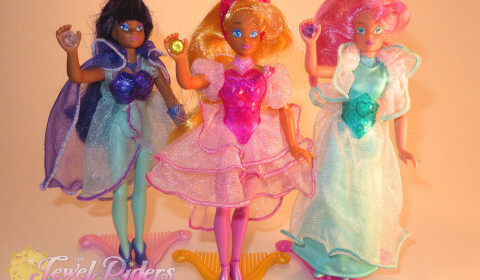 Each came with a flag comb and a rooted hair tail. 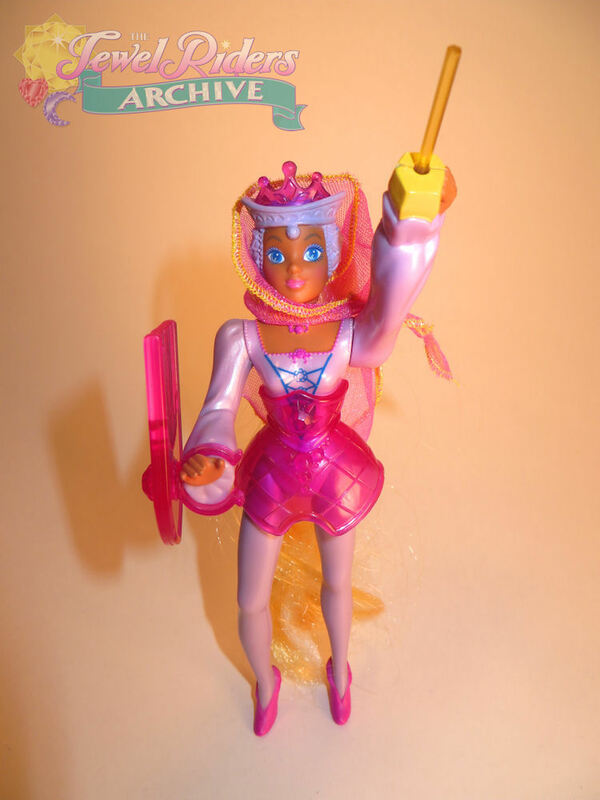 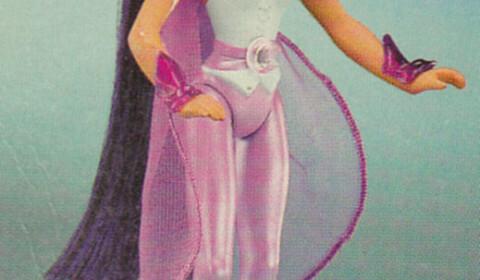 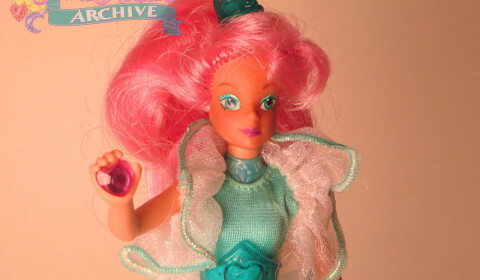 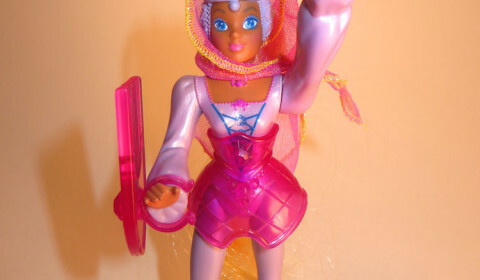 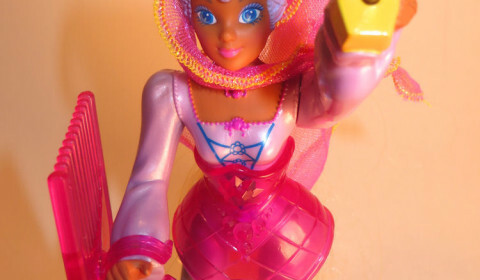 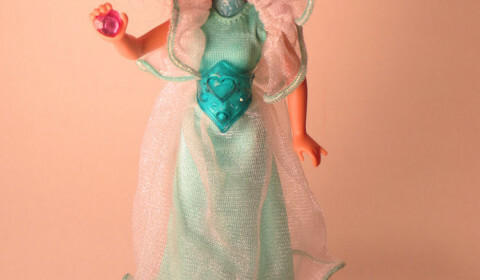 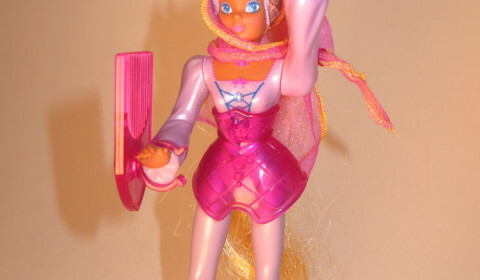 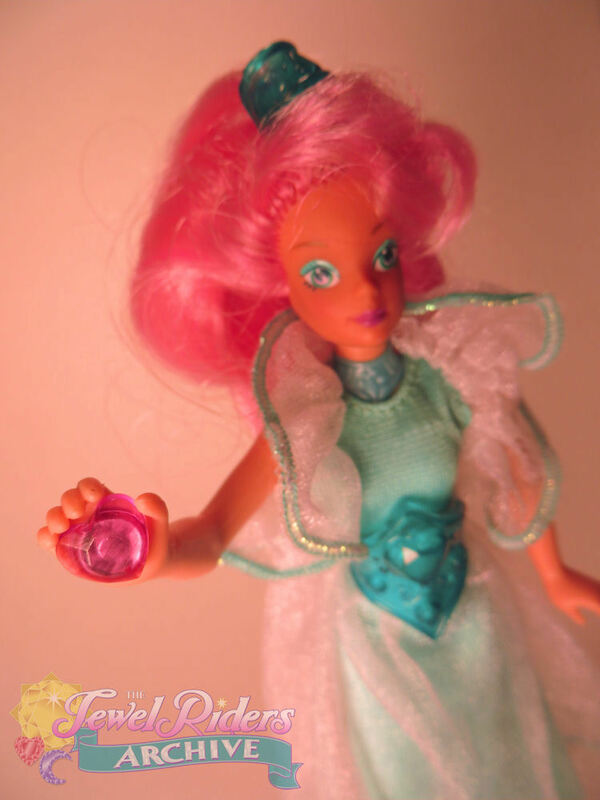 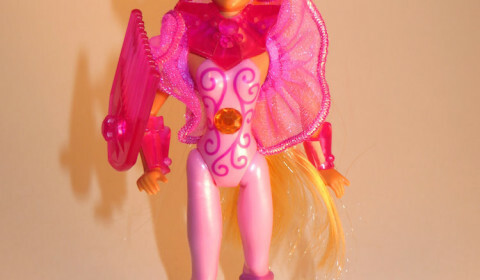 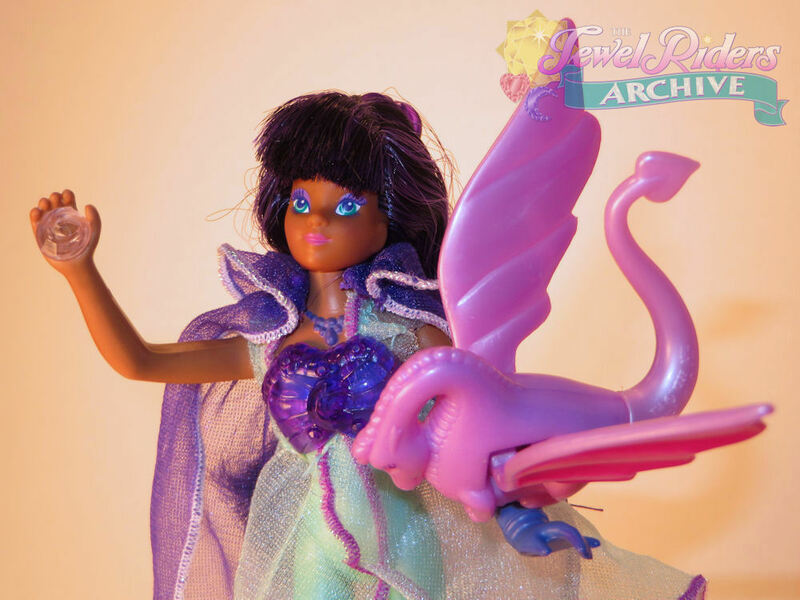 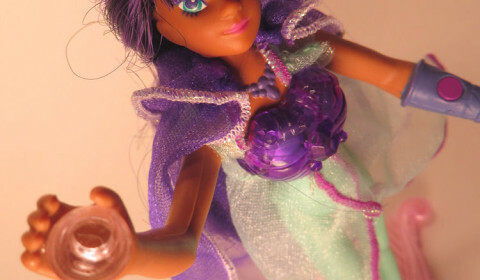 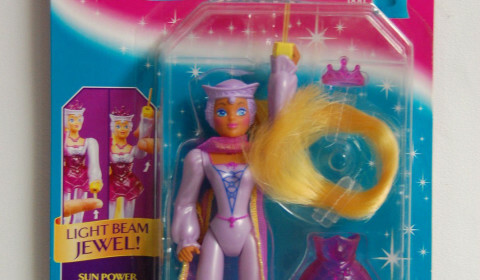 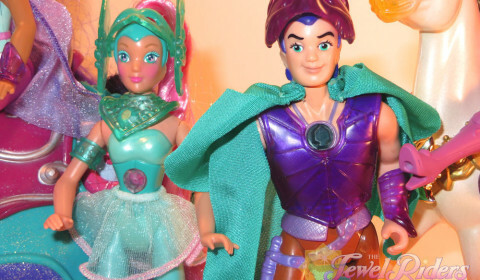 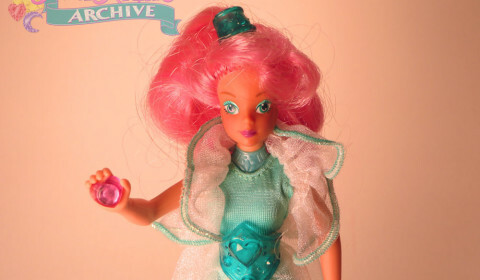 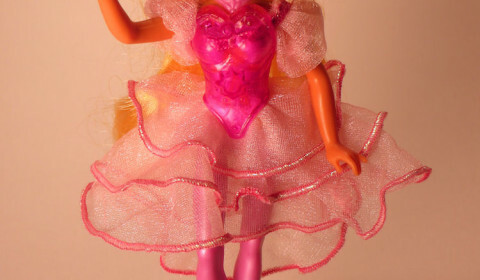 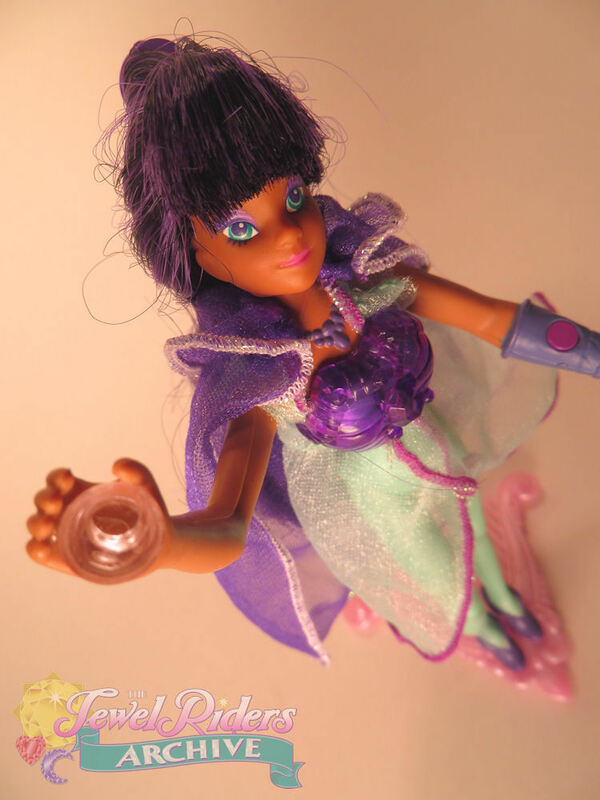 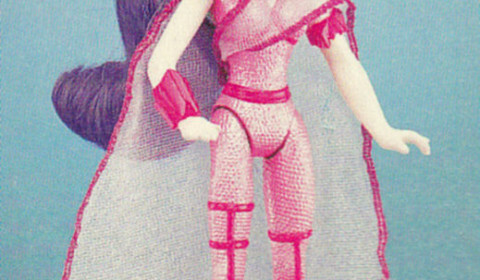 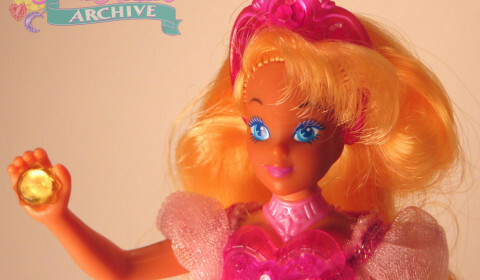 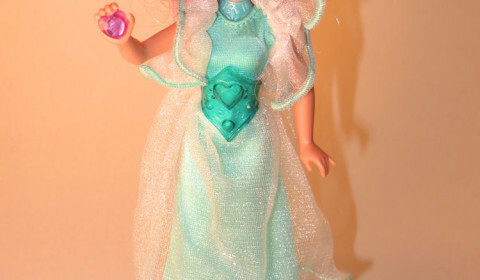 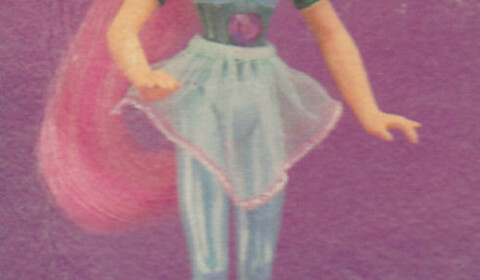 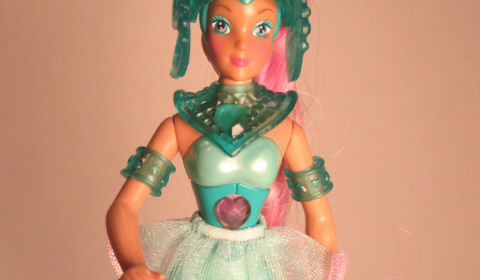 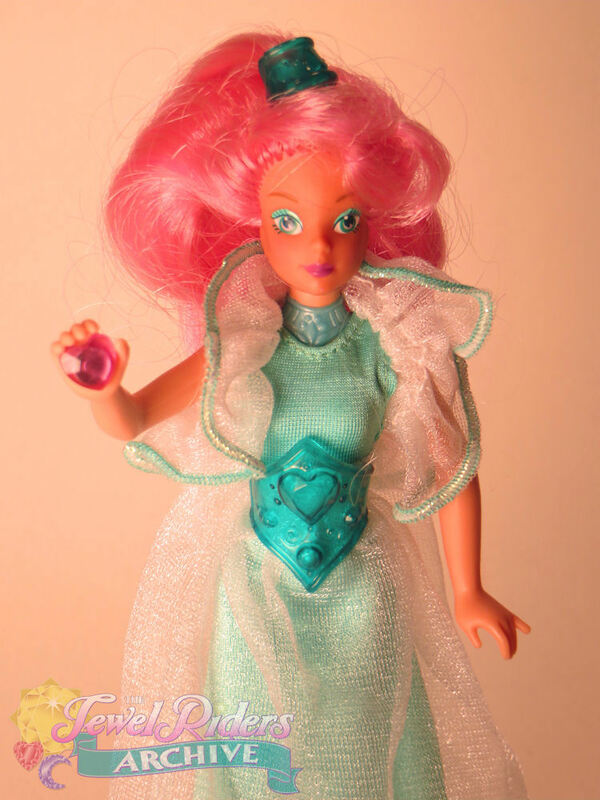 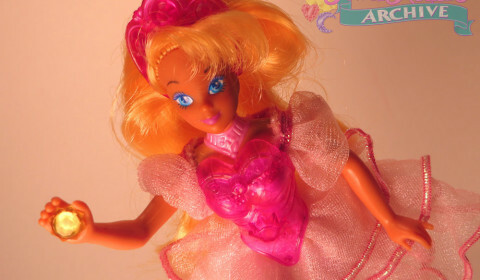 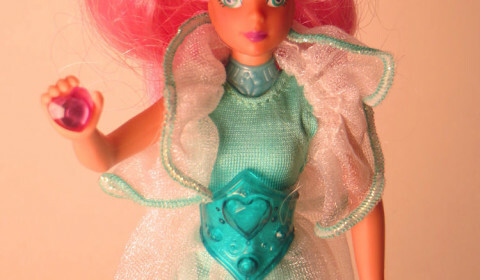 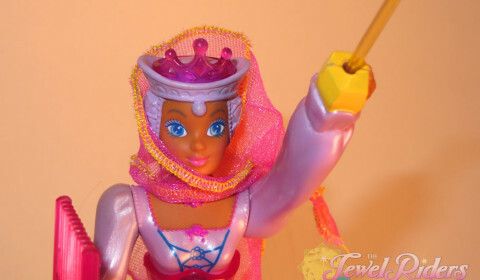 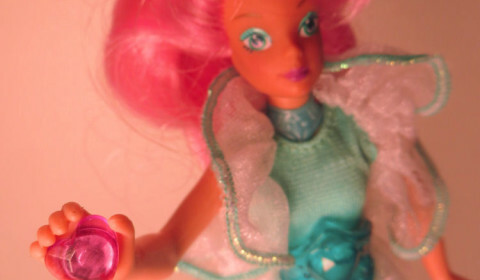 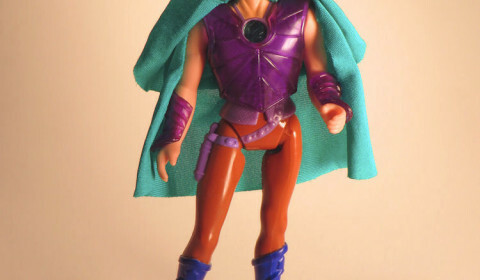 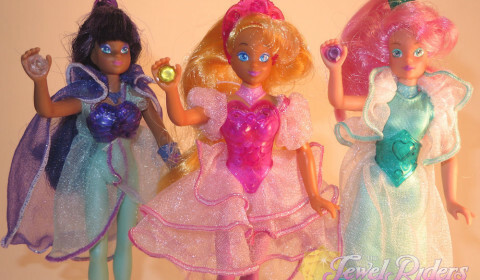 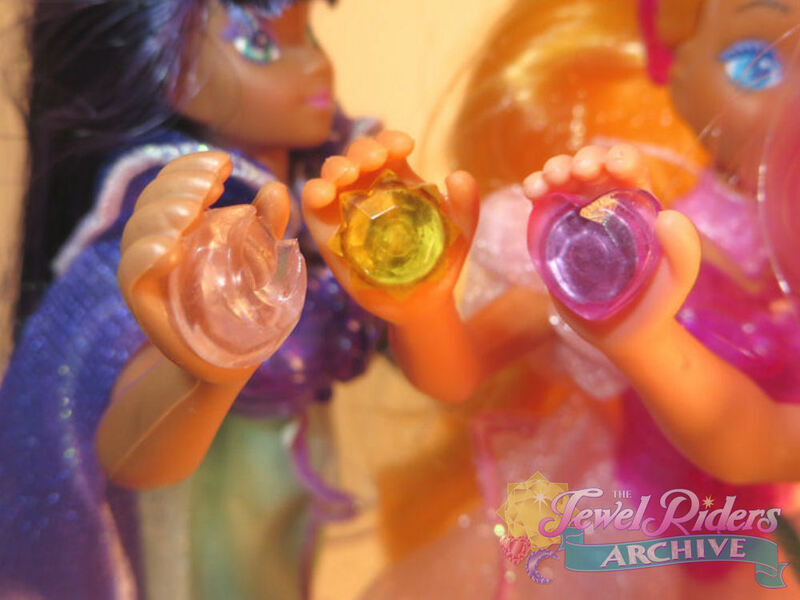 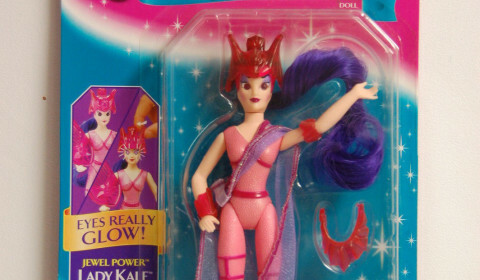 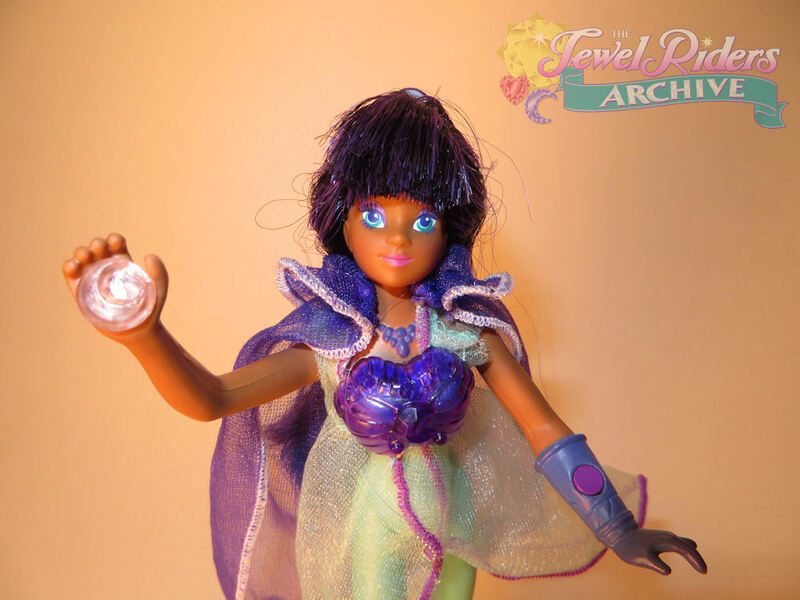 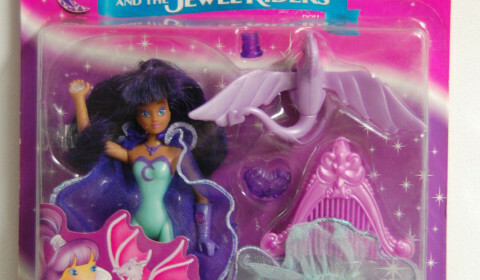 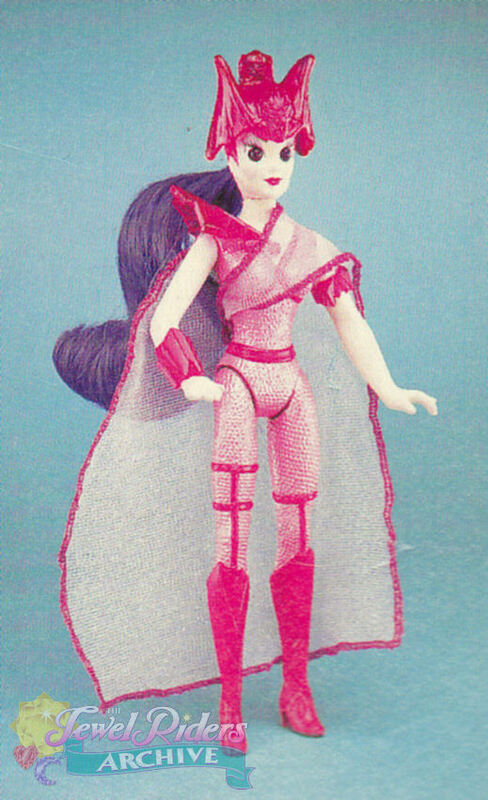 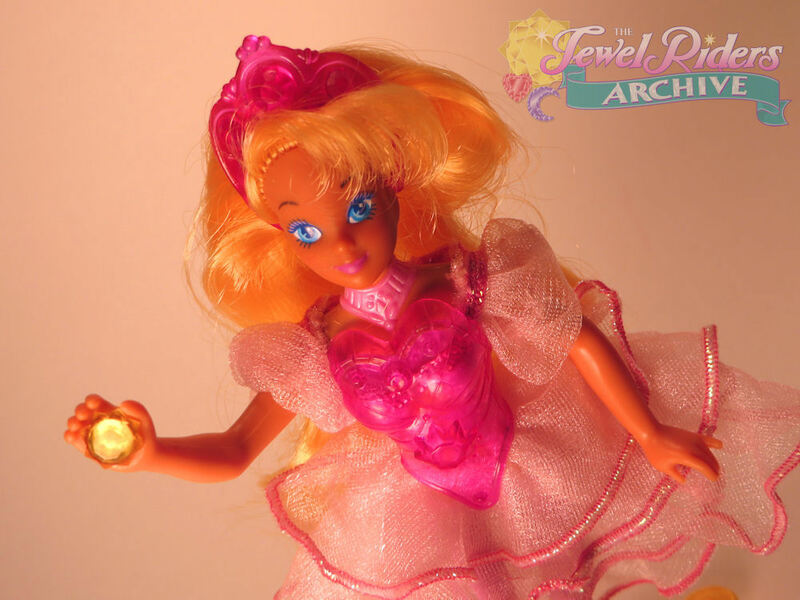 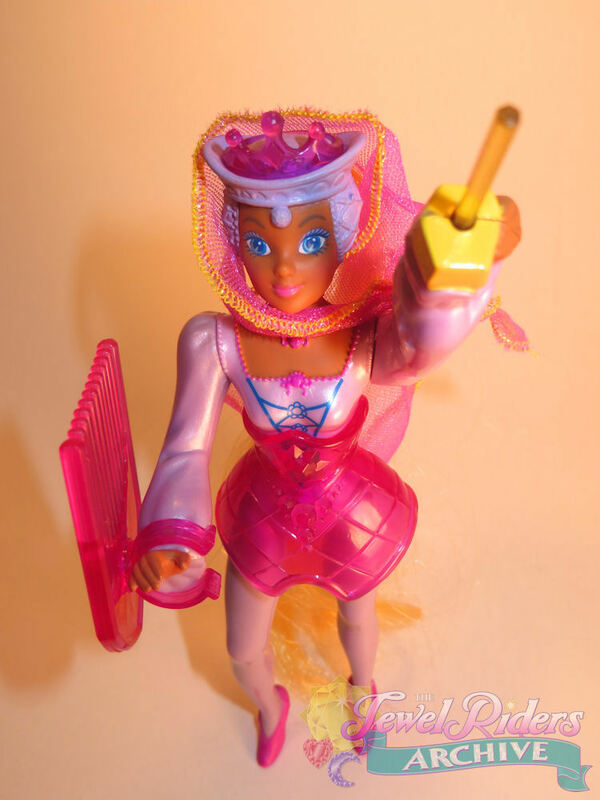 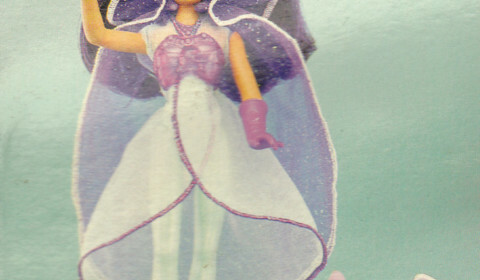 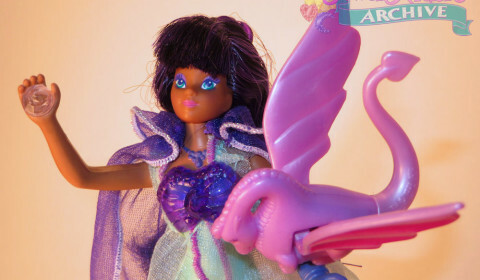 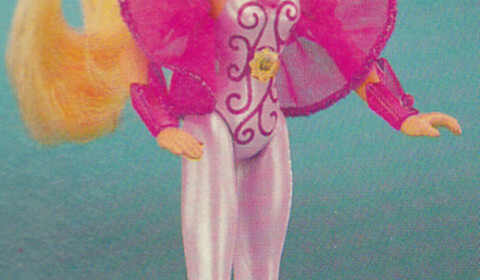 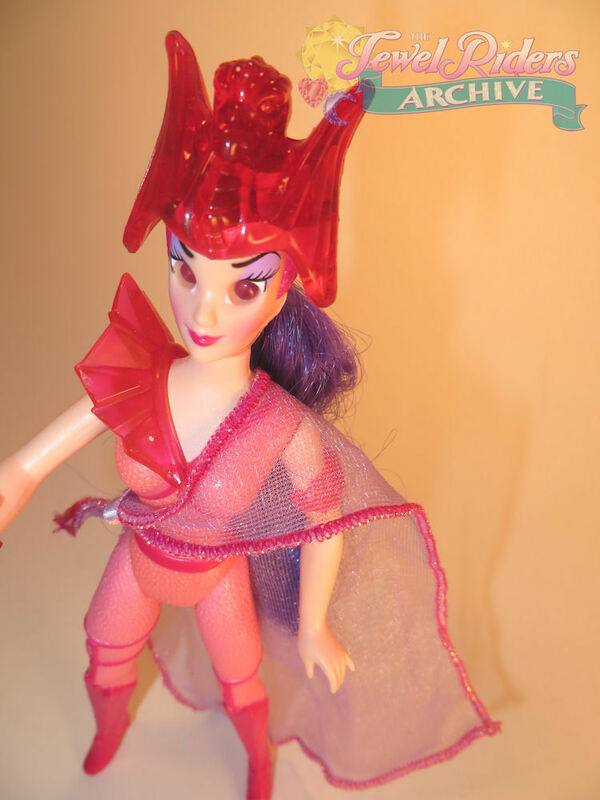 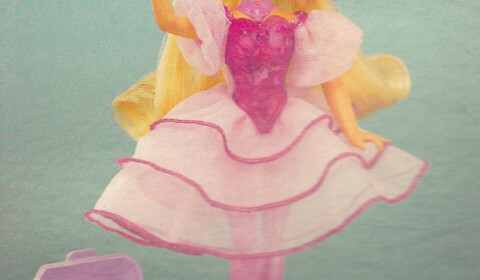 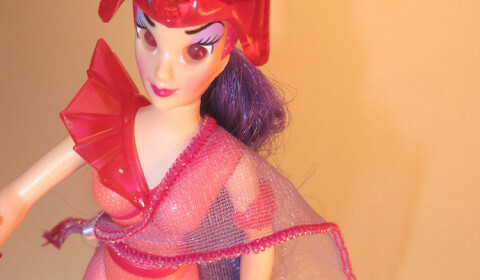 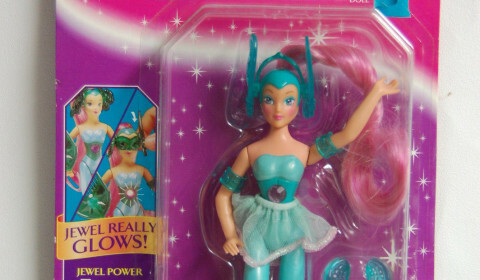 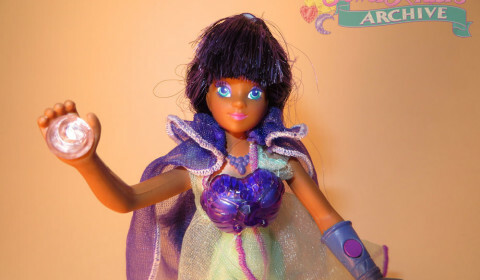 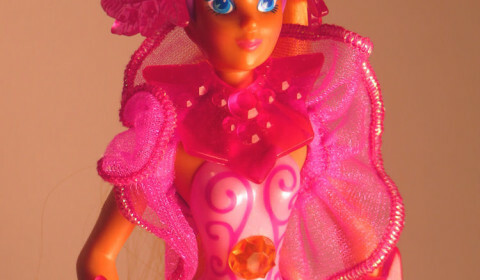 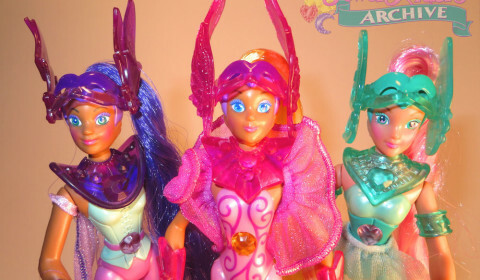 Both featured the light-piping glowing jewel feature of the “Jewel Power” dolls. 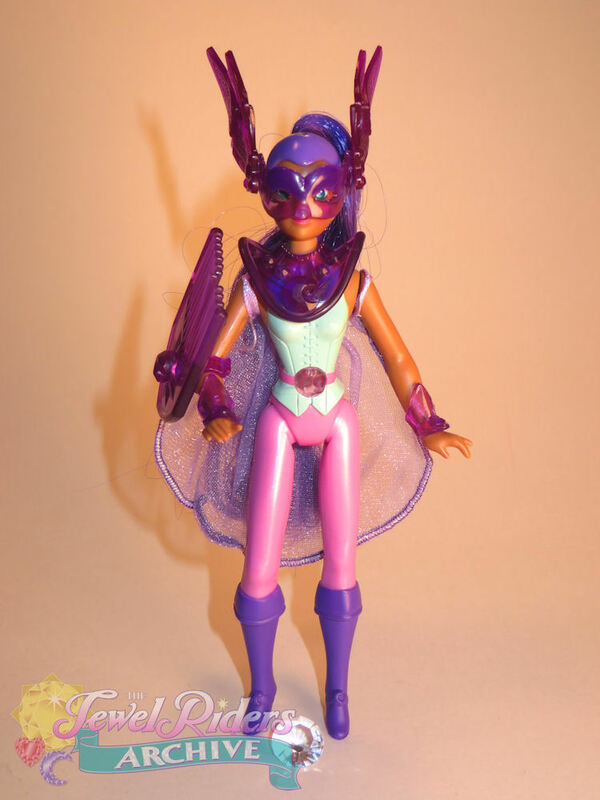 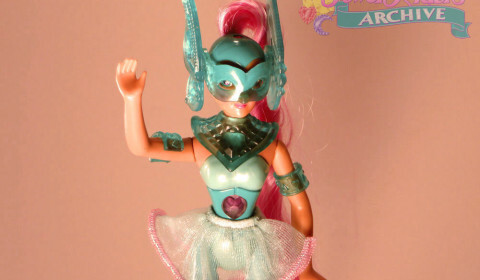 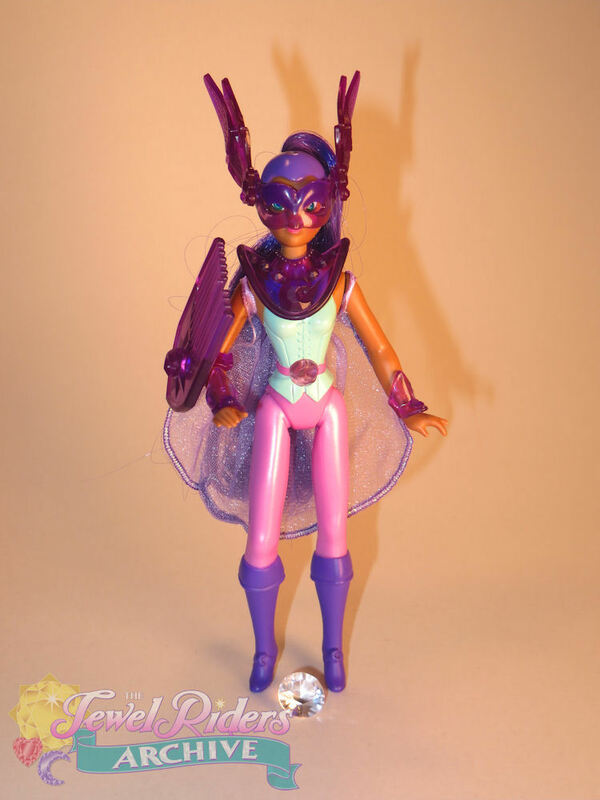 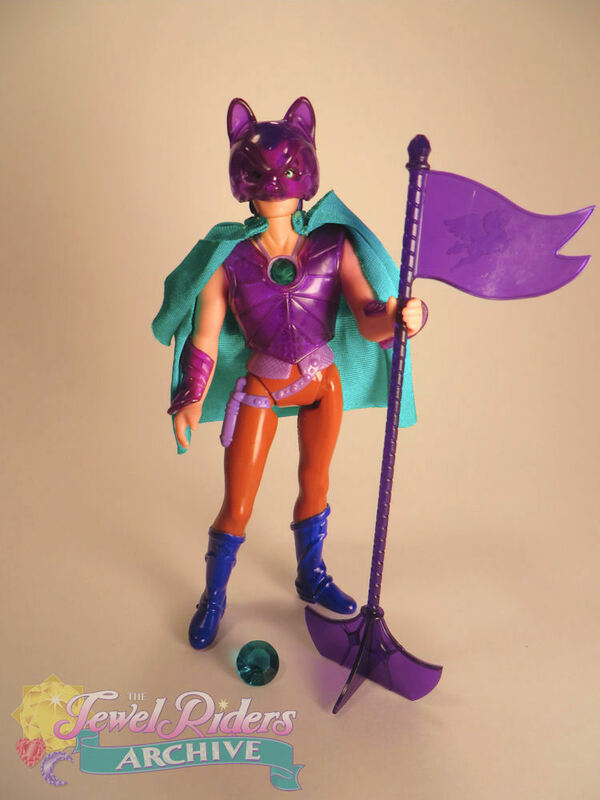 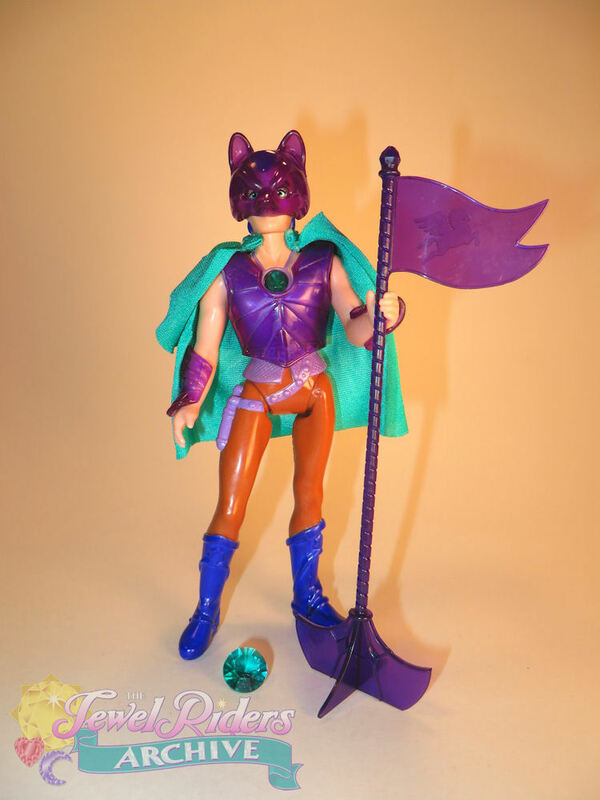 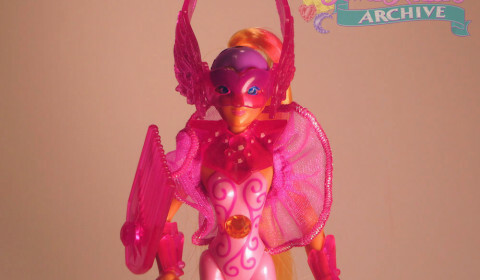 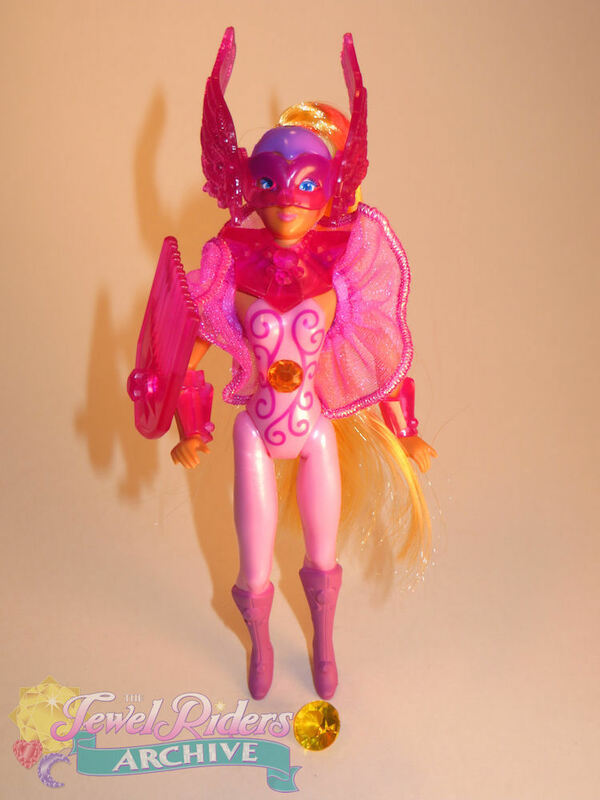 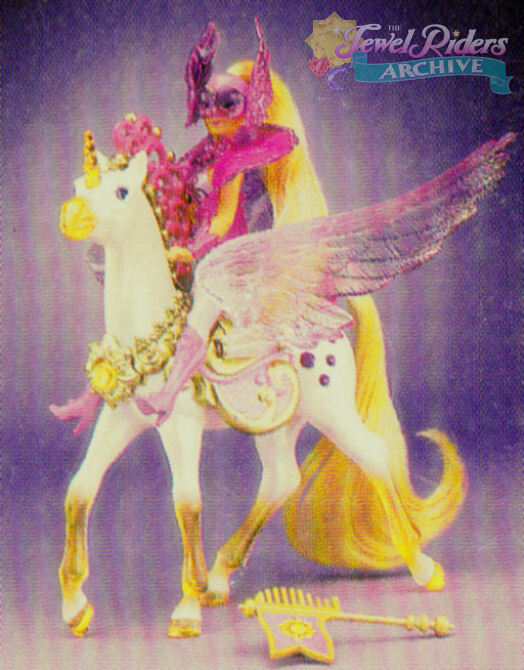 Sunstar came with a saddle that had her wings attached, and Moondance came with a saddle, flags, and mask. 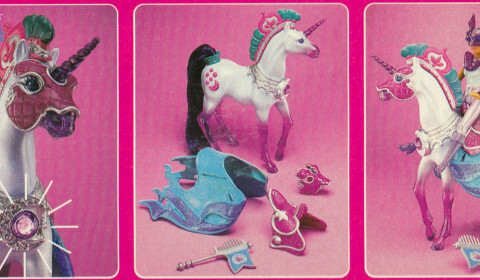 Both unicorns had variants based on the color of the plastic surrounding their jewels. 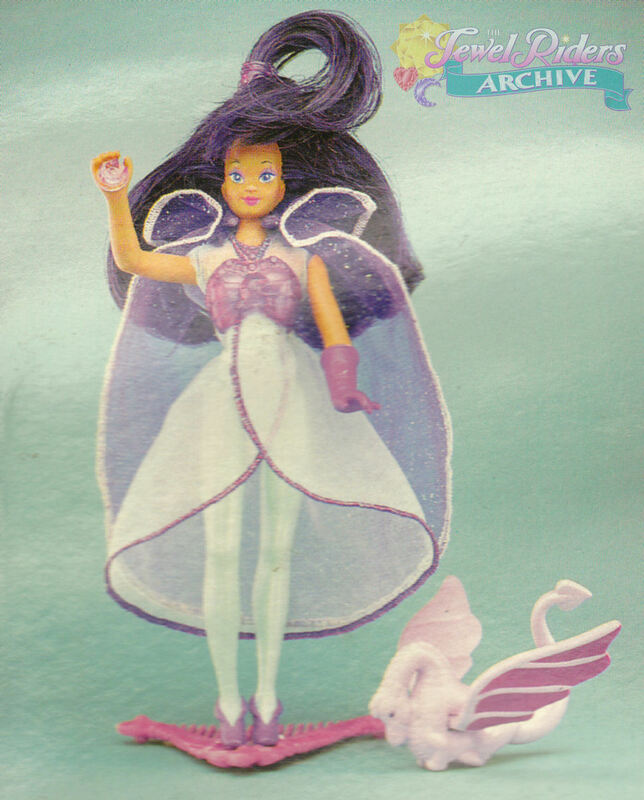 In one edition, the plastic was metallic gold (for Sunstar) and metallic silver (for Moondance). 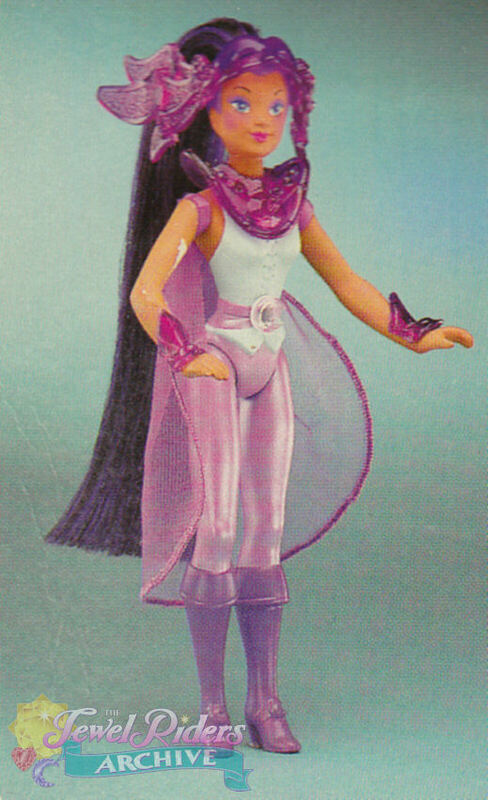 In the other edition the plastic was pink (Sunstar) and purple (Moondance). 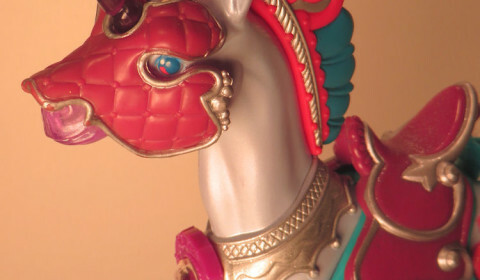 The metallic edition seems to be the more rare edition. 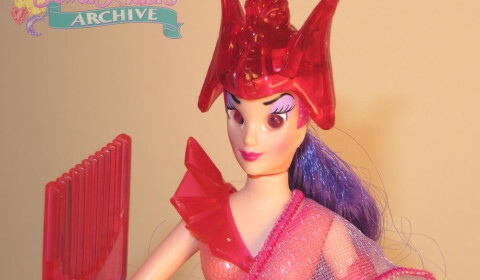 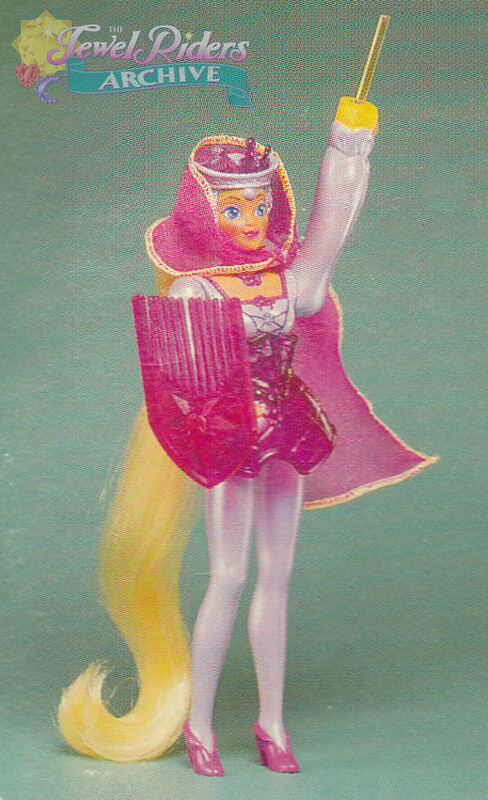 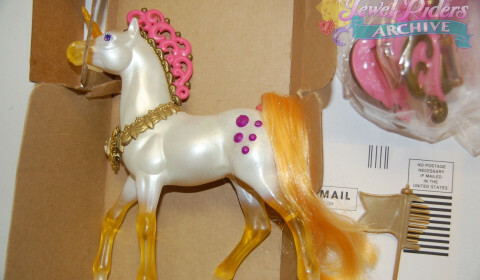 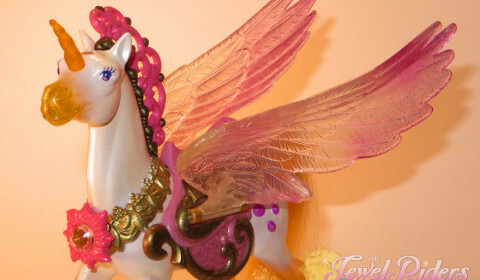 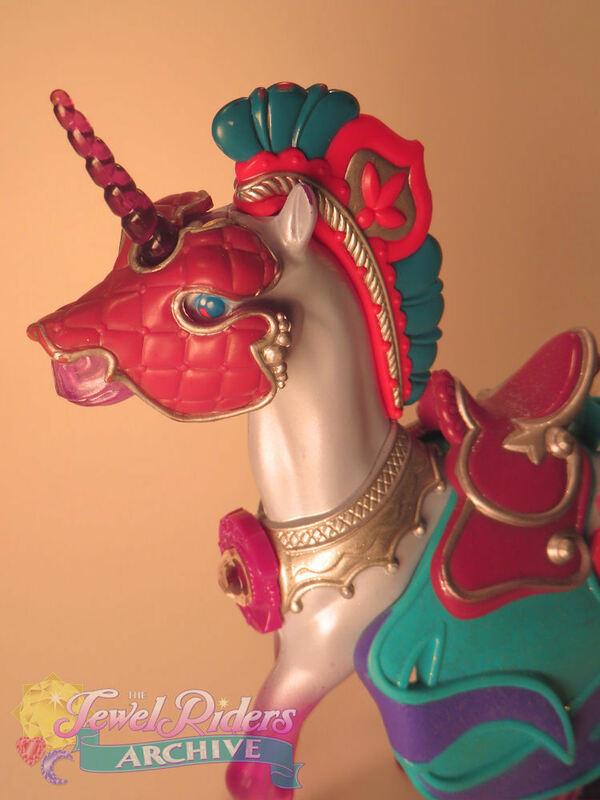 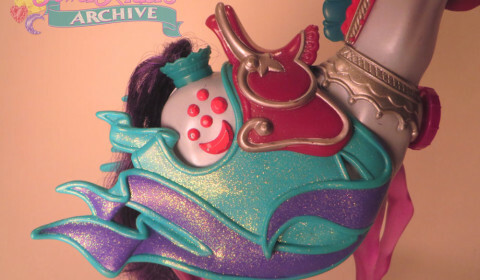 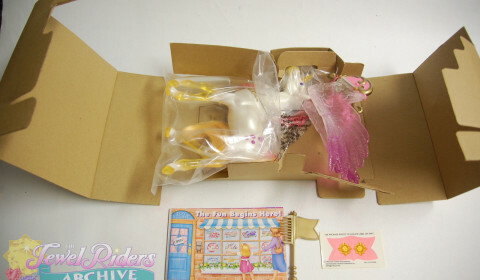 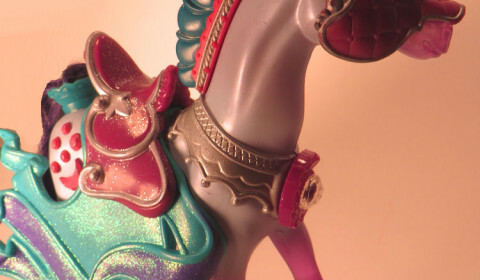 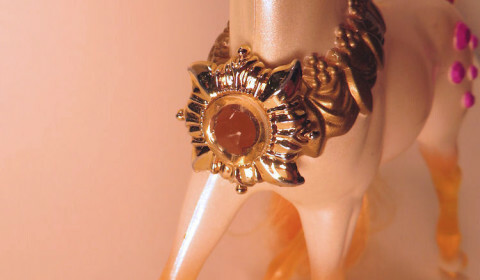 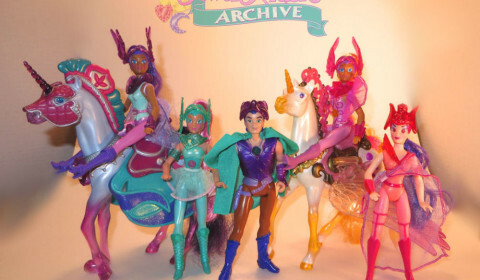 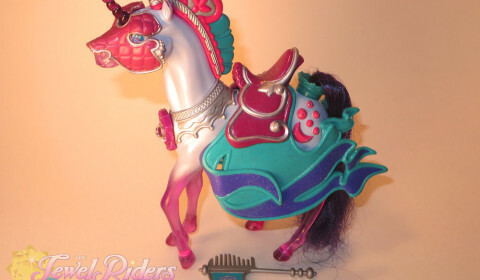 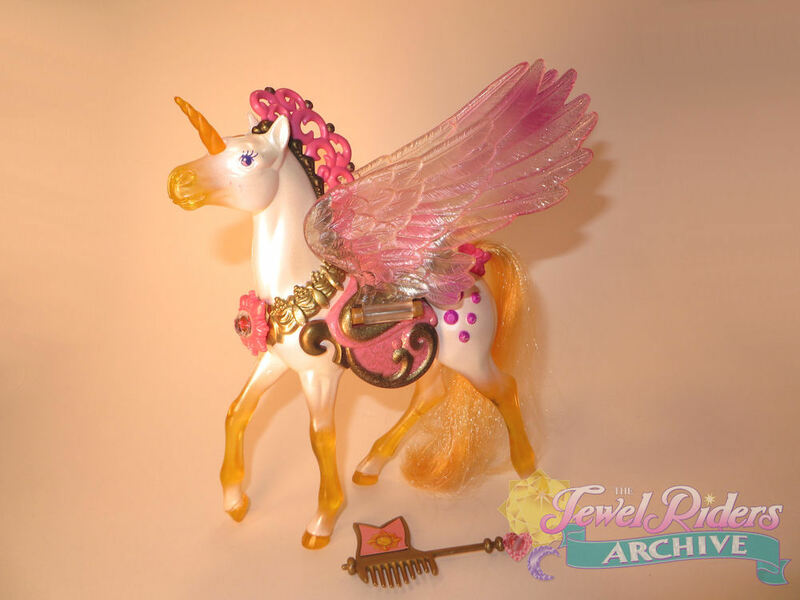 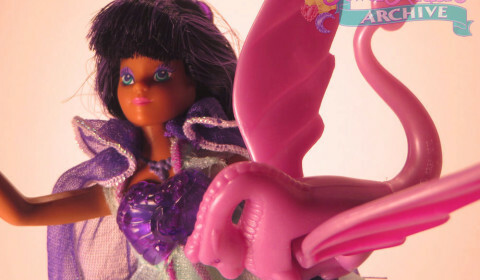 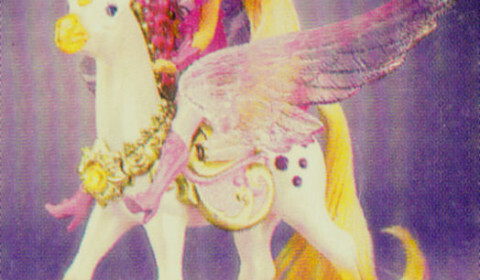 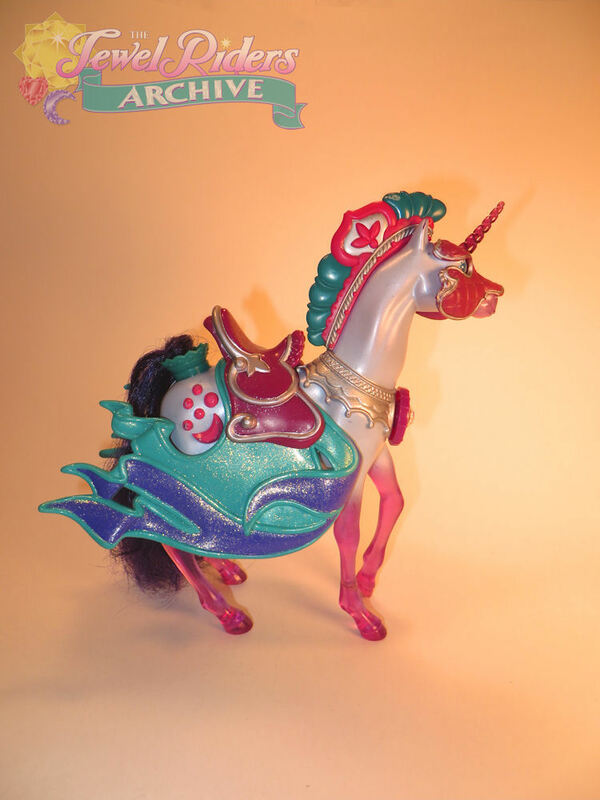 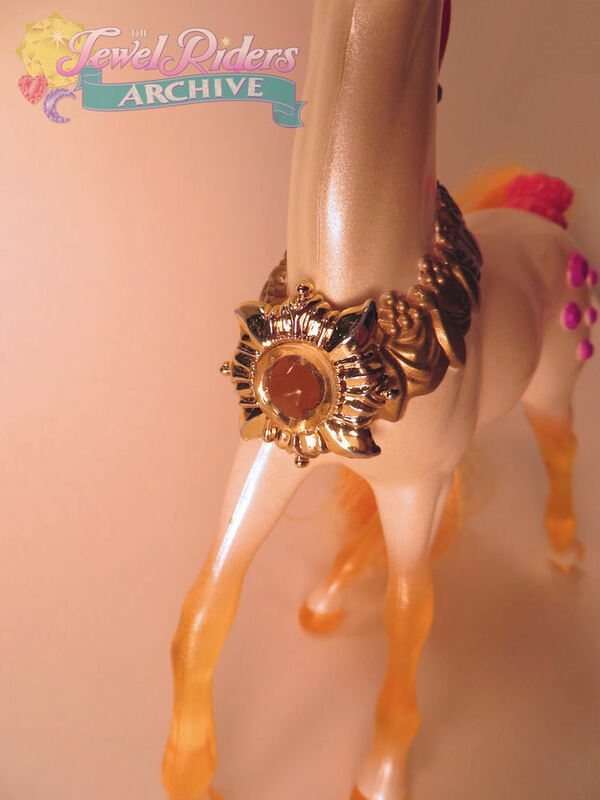 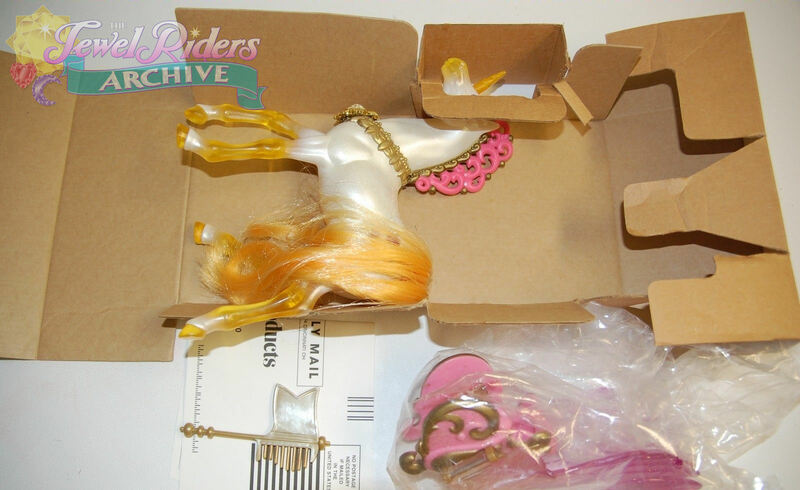 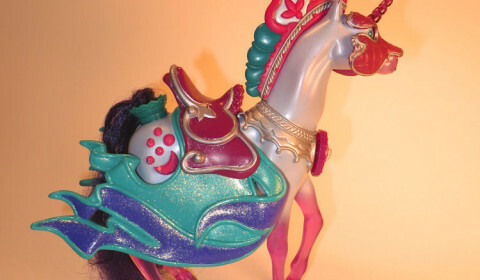 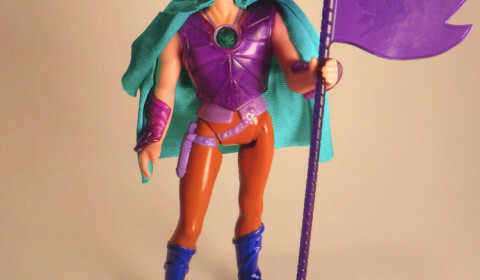 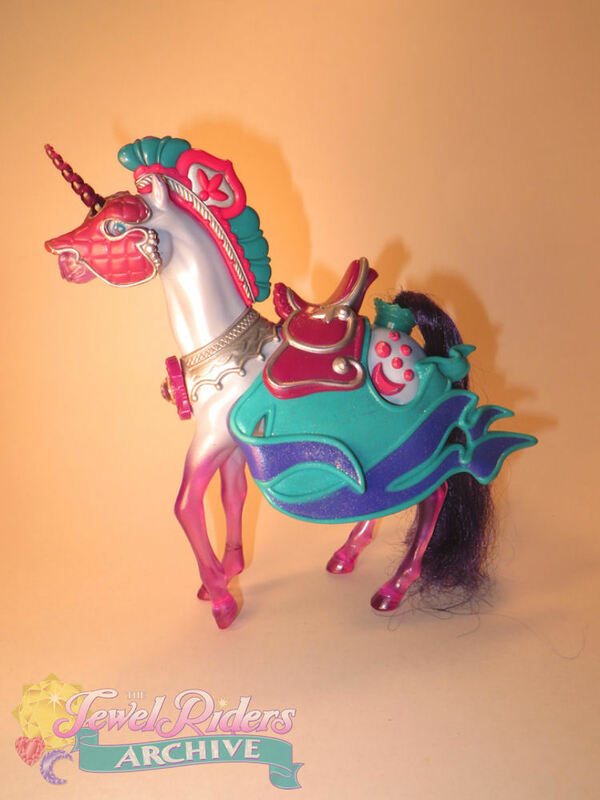 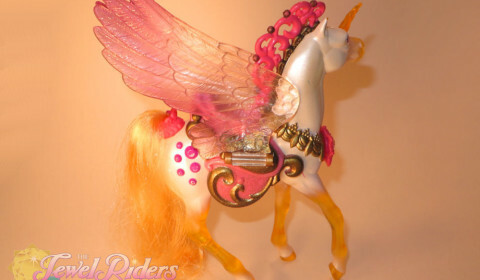 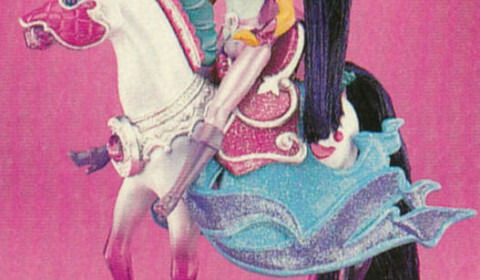 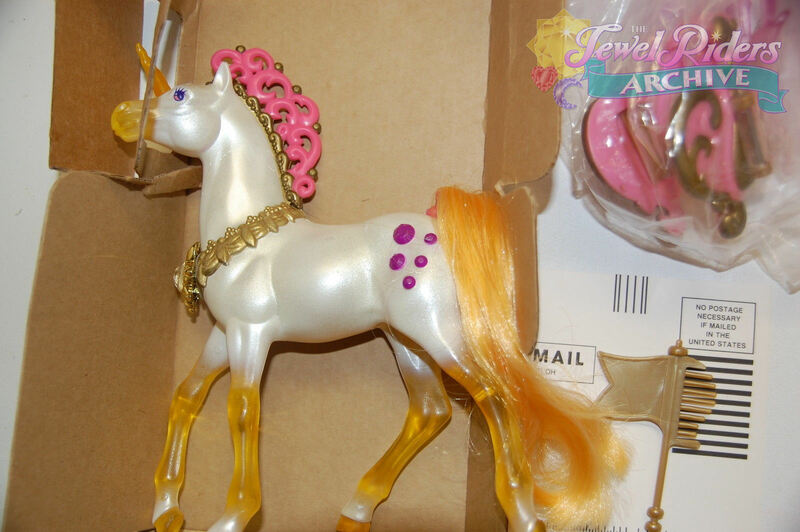 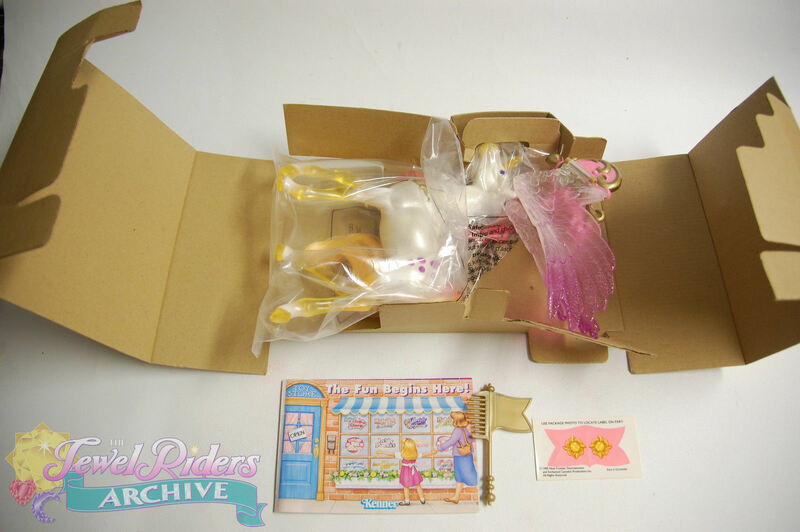 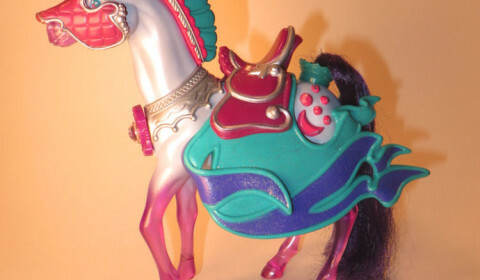 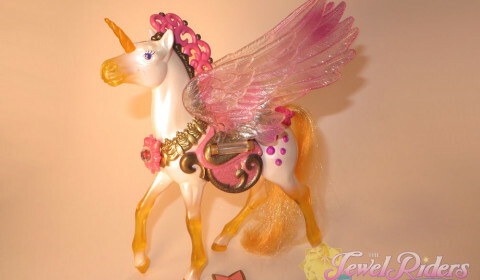 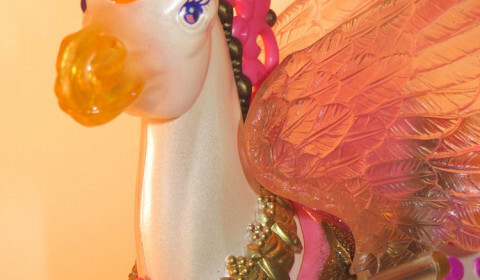 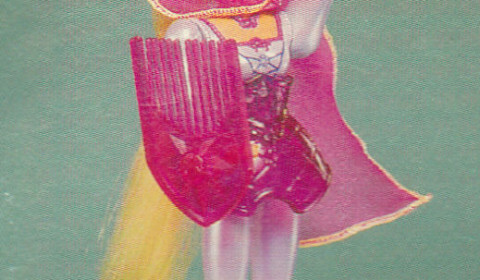 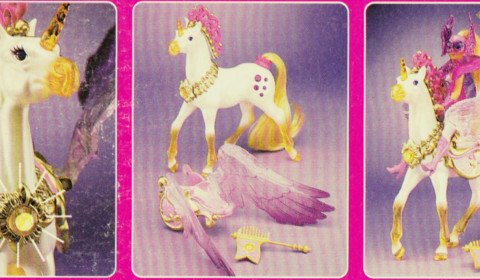 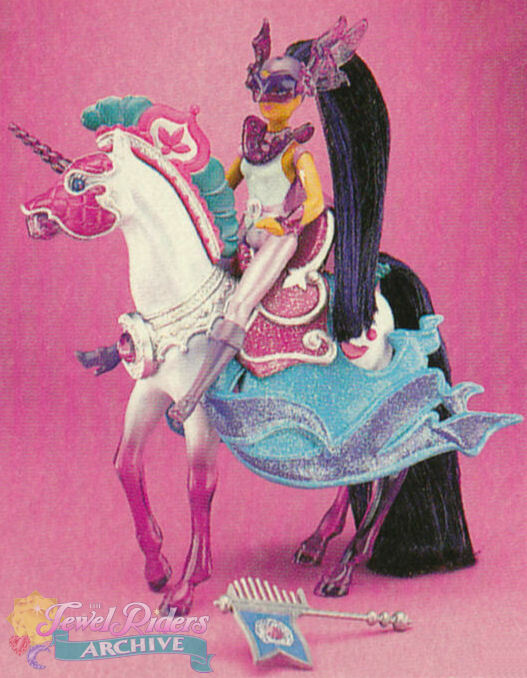 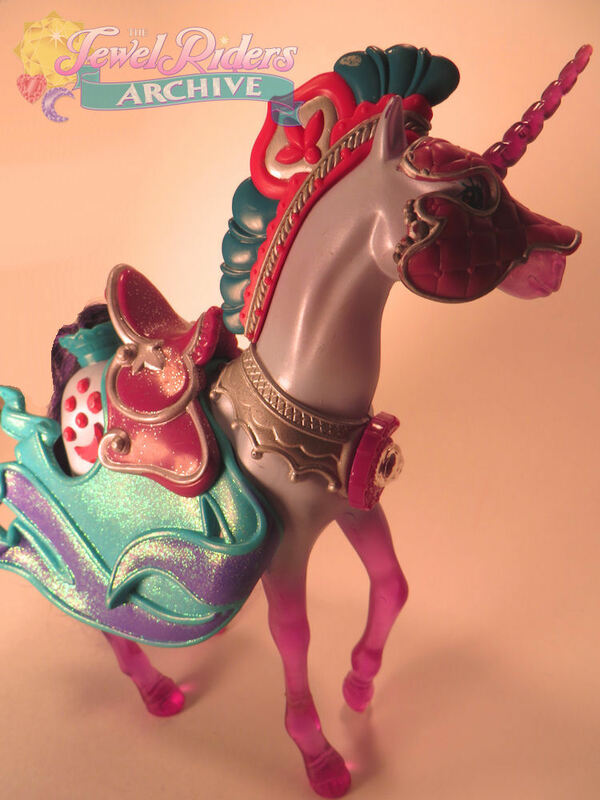 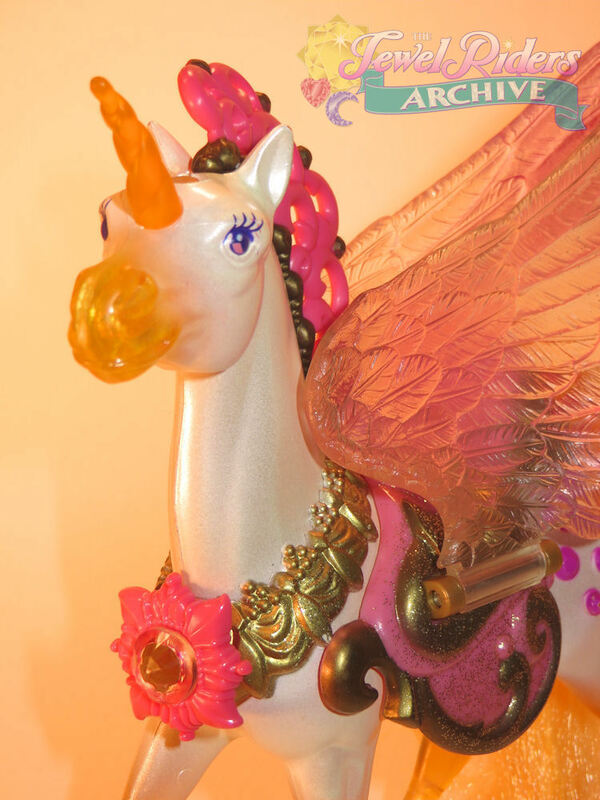 Each of the unicorns shares a mold with one of the horses in Kenner’s “Fashion Star Fillies” line. 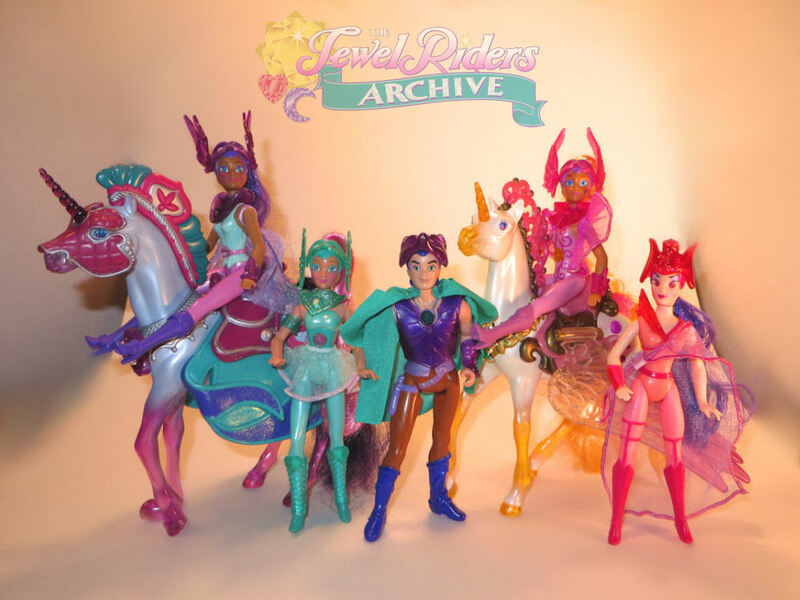 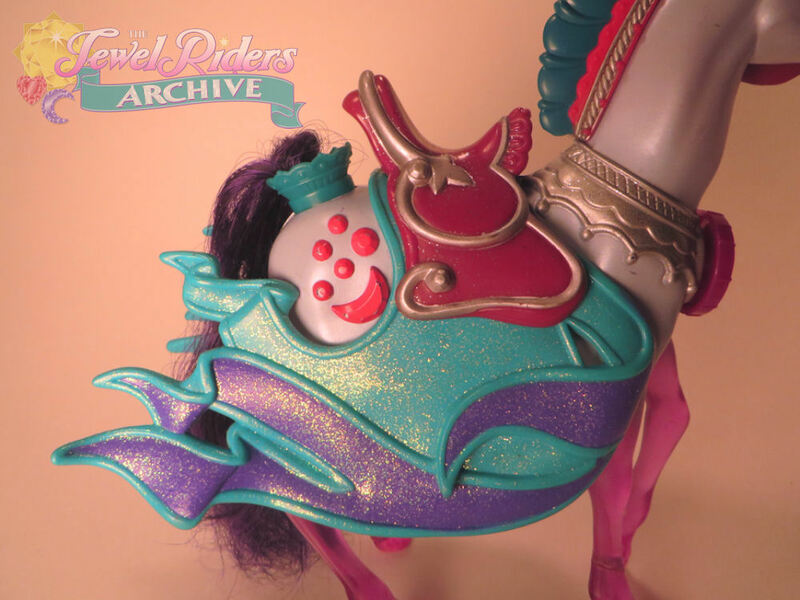 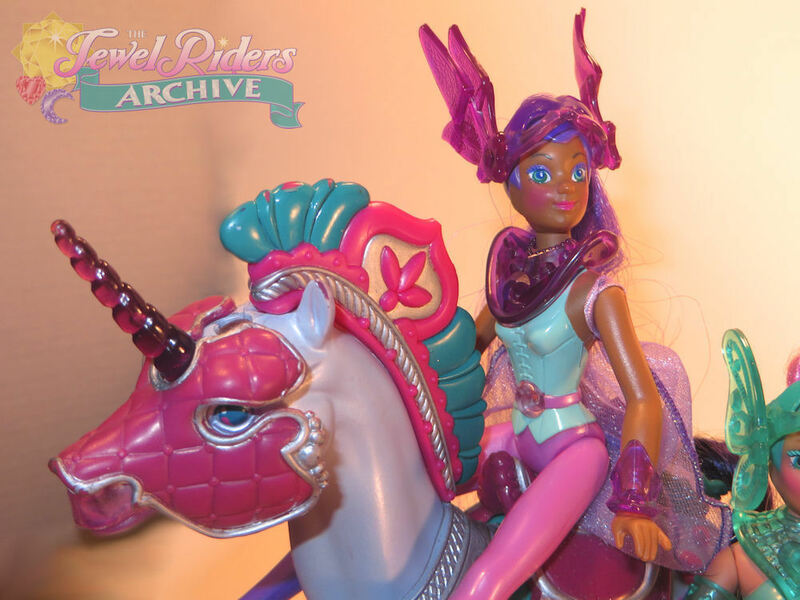 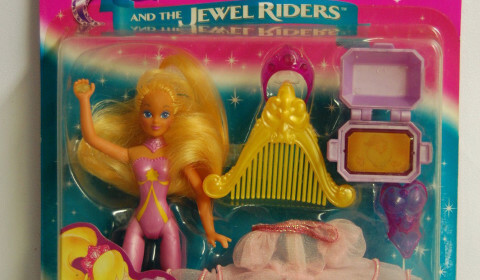 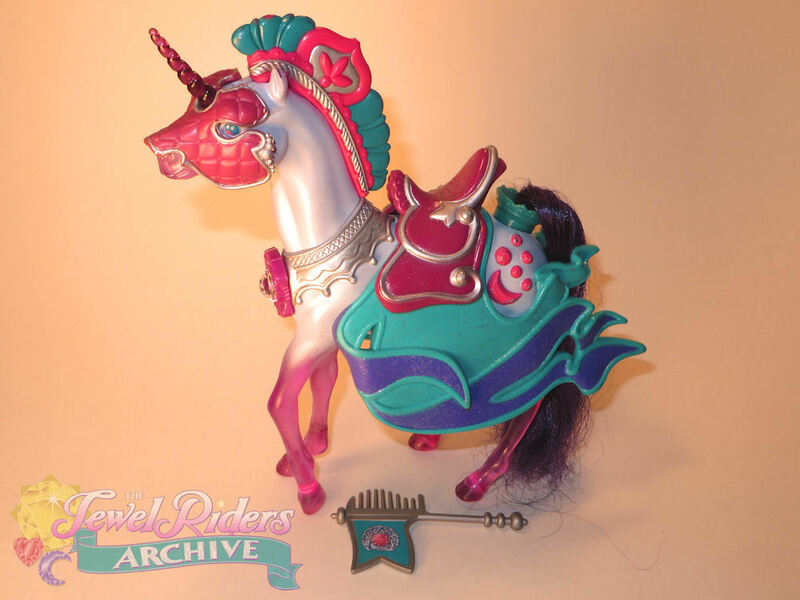 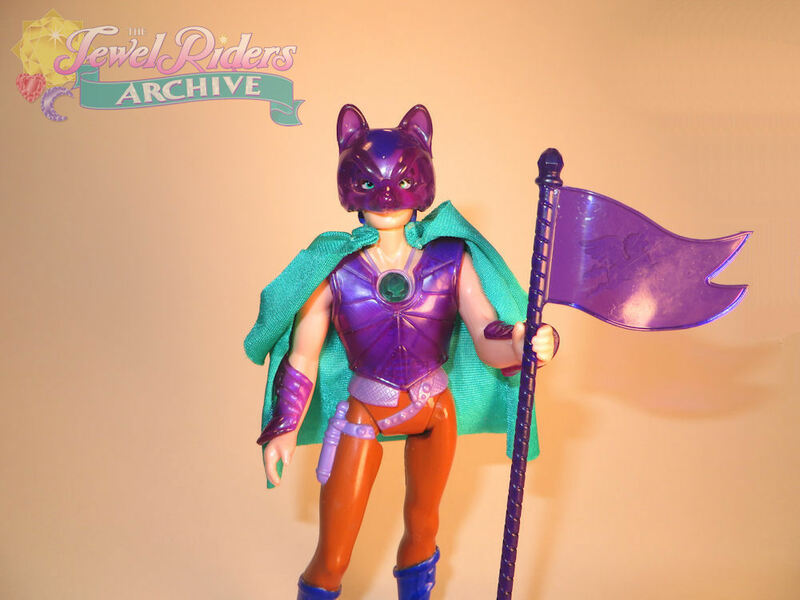 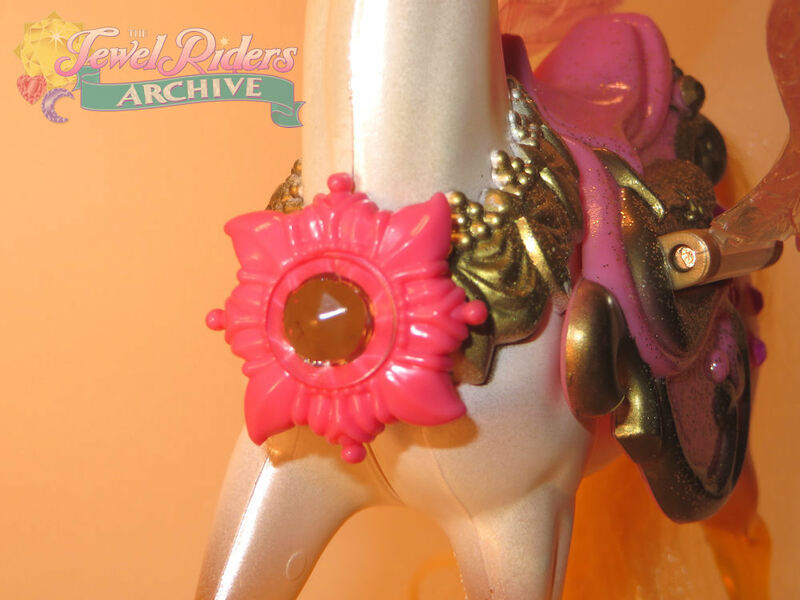 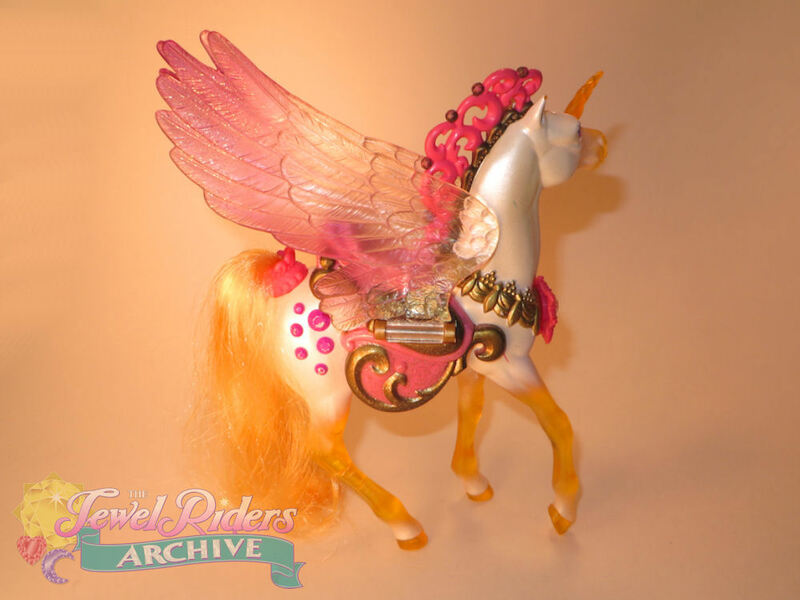 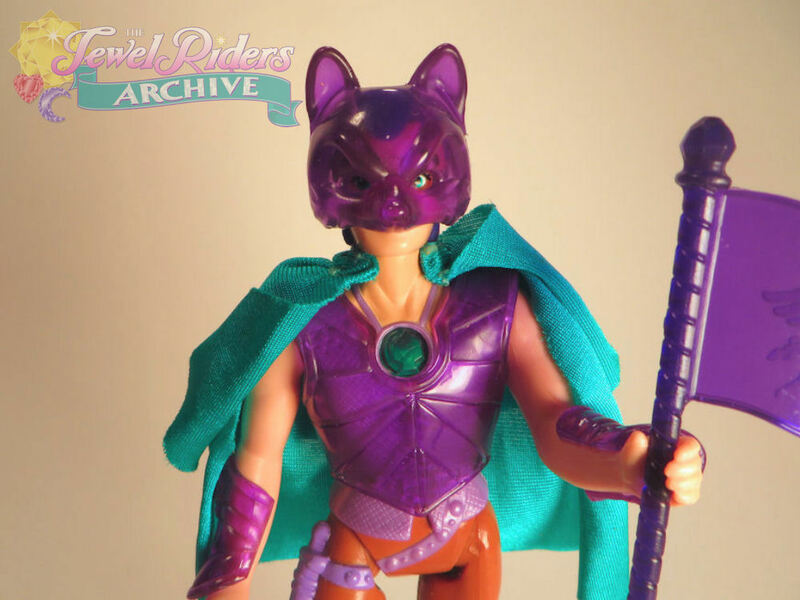 For more information on the marketing, commercials, and behind-the-scenes selling of these toys and other Jewel Riders merchandise, visit our Marketing page!